What makes a beer a Lager, or a Pale Ale, or a Pilsner, or Porter or a Stout? 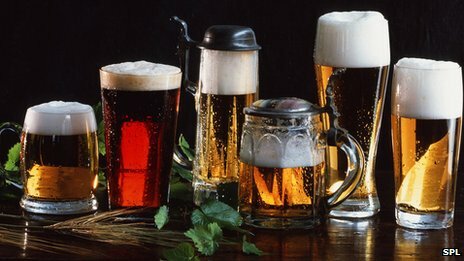 Why do some beer styles taste similar but have different classifications? What’s a seasonal ale? Why are some released only in a limited number? And who makes all these decisions? The answer is not as simple as you might think. Who makes all of the decisions is the person brewing the beer, but even then circumstances beyond their control can change everything. 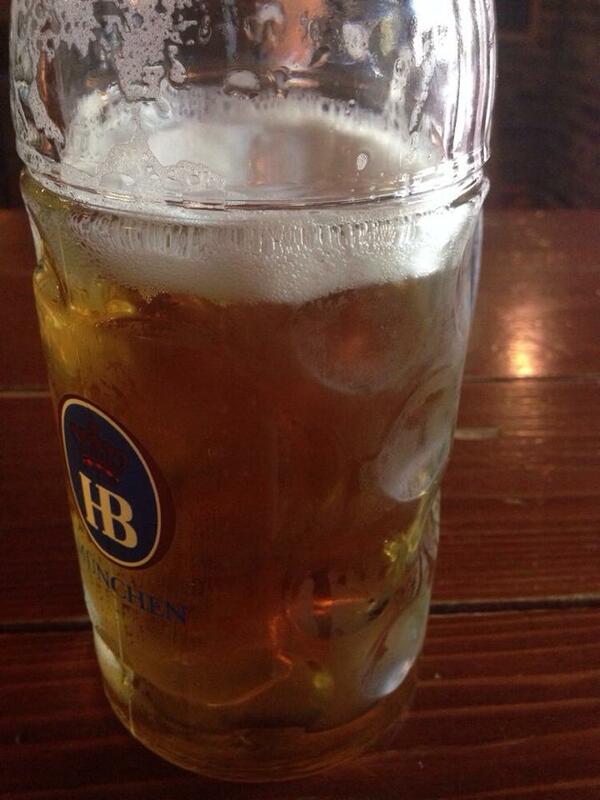 To answer the other questions, lets start with another… What is beer? Answer: Approximately 95% water, the other 5% consisting of alcohol derived from boiled grains whose sugars have been converted by yeast and flavored with another agent, usually hops. Those four simple ingredients and the varied multitudes they come in create the thousands of varieties of beers available. Now, I know what you’re saying, water is water. Wrong! The water in Belgium that is used to make farmhouse ales and the oh so delicious Belgian style ales has a different mineral content than the water from Bavaria, which is obviously influenced by the nearby Alps. The varied topography of America makes it’s a really rich variety just based on water alone. 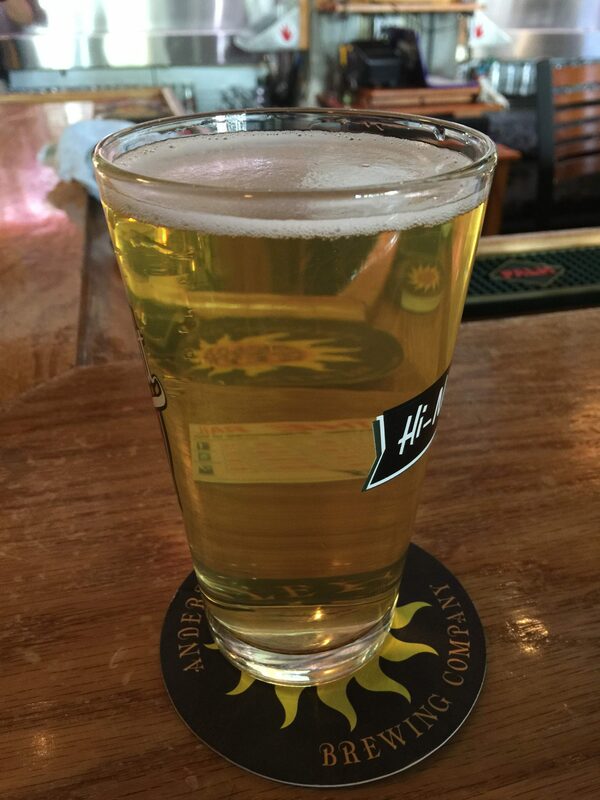 Grains are usually barley based, but can contain adjuncts like corn and rice, particularly if it is a lager. Wheat, Wit, Hefeweizen, all are wheat grain-based beers. 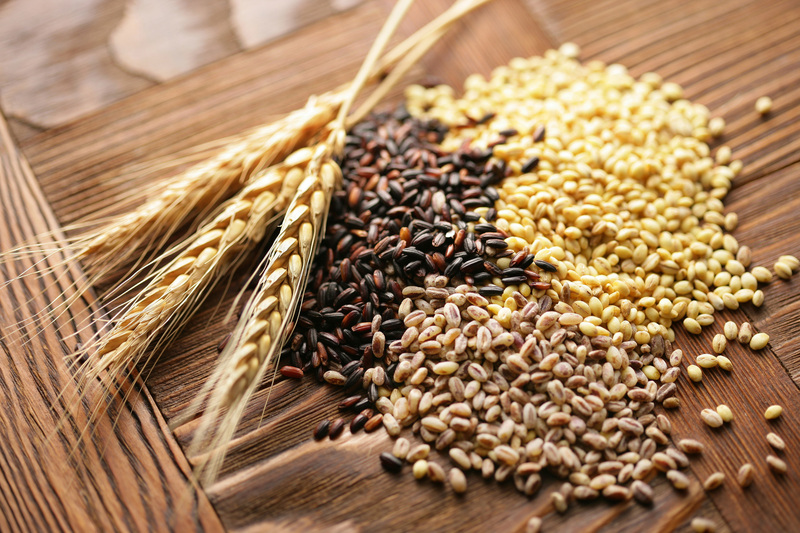 Roasted barley gives you the darker colors associated with Porters and Stouts, and some Stouts use oats as well for the smooth milky texture. Rye used for Reds and other darker colors. And in Barley alone there are different varieties available, Two-row, Six-row and others. Rice that is brewed and fermented is usually Sake, which is a whole other topic (and coincidently a post). These same grains when distilled will give you whiskies (bourbon, scotch, whiskey, etc.). Yeast is a funny little creature… Yes, I said creature. They are single cell organisms which are used to convert the sugars from steeped grains into alcohol. There are various strains and they are used in the making of Wine, Whiskies, Beers, Kombuchas, Sakes, probably some others that you my not have heard of. Basically they are a fungus. But don’t think about that. This about the lovely work they do creating some of our favorite beverages. And when converting those sugars into alcohol they create carbon dioxide and they leave a signature flavor behind when they do. There are two main types: Top Fermenting yeast which is used to makes Ales, and Bottom Fermenting Yeast which is used to make lagers. And within these two types there are many different varieties. 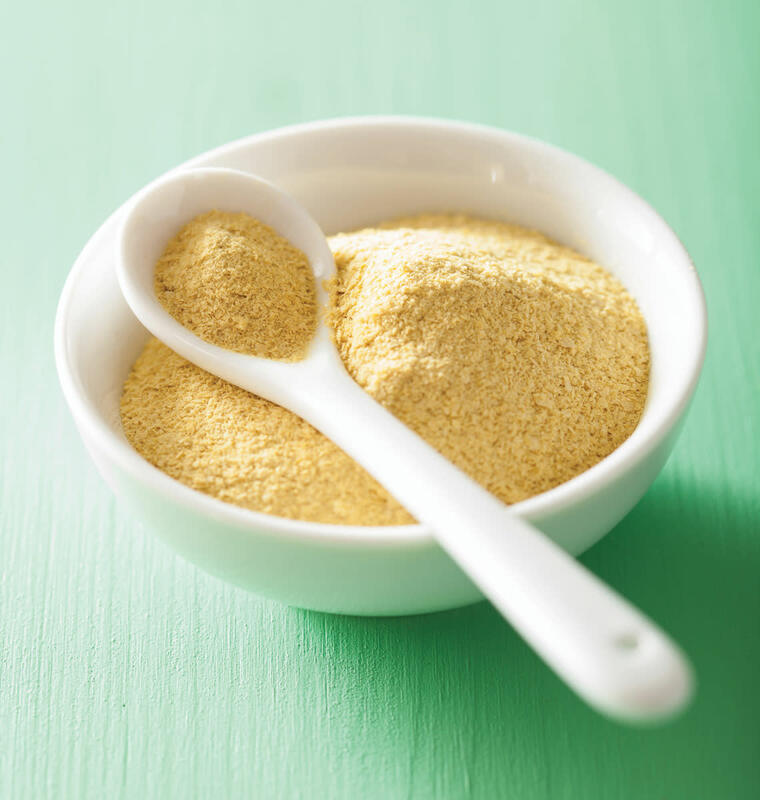 There are also a yeast type called Spontaneous Fermentation, which occurs when vats of prepared wort are left open to the surrounding environment to allow naturally occurring yeast strains to work on the sugars and convert them. And this brings us to the hops. This funny little green budding plant (not too dissimilar to Mary Jane both in appearance and genetic structure) emits specific types of oils on their bud leaves when in bloom. There are three categories of hops consumed for making most beers (Bittering Hops, Aroma Hops, and Dual-Purpose Hops), and within those categories there are over 80 varieties currently being harvested for production. Hops not only brings bitterness and flavoring to counterbalance the sweetness of beer, but it also adds a preservative value. So let’s say we only have 10 different varieties of water, not true as there are many more, but let’s just say that. Multiply that by the 10 grain varieties. Then multiply that by let’s just say 20 strains of yeast. Then we will multiply that by the 80 varieties of hops currently available. That’s 160,000 varieties of beer available. And this doesn’t include all of the water combinations, yeast strains and unknown hop varieties. Then let’s throw in the mix of the brewer’s preference of how long he let’s the grains seep, how long of a boil he uses and how many varieties of hops he adds, and then just for fun let’s and blending into the mix. The amount of different varieties of beer that have yet to be discovered is staggering. If you drank ten different beers a day from the age of 21 to 91 and never repeated a beer, that would be over 250,000 different beers. I still don’t think you could sample them all. Macro vs. Micro; Craft vs. Big Beer; Local vs. National; Independent vs. Investor owned… How can anyone find their way through this maze of us vs. them? How do we know which beers we can enjoy and which to avoid? And why should we avoid any? To understand this terrain, we need to look back through beer history to see where we were and then we can follow the paths that were taken to get where we are today. Don’t worry it won’t be that long of a trip. Before America was even discovered by European explorers, the beer landscape was much simpler. There was no beer in America and in Europe it was dominated by Ales, not Lagers. Lager beers were still in their infancy stage and wouldn’t explode until the mid 19th century. 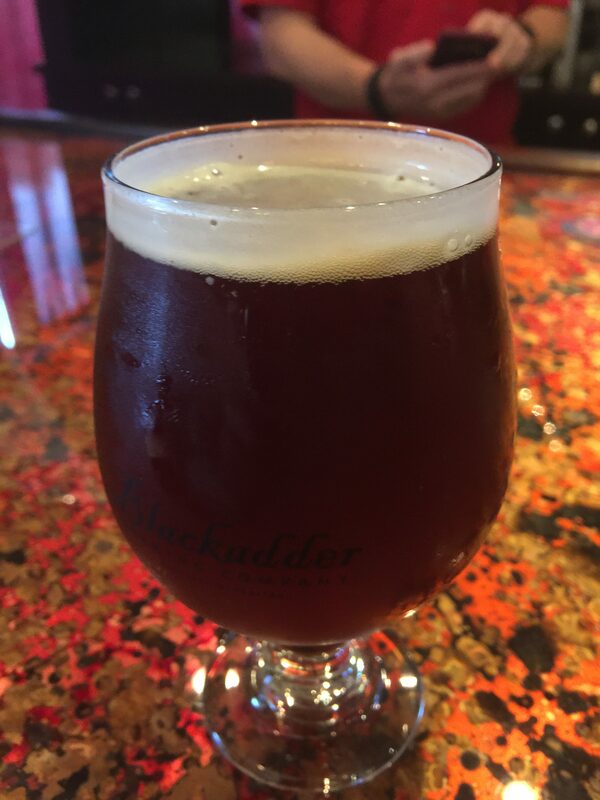 When European settlers came to America in the 1600’s they brought with them the more common style of beer at the time, which were Ales, specifically Pale Ales and Porters. The first President of the United States, George Washington, brewed his own beer and was found of a Porter brewed with Molasses. During the mid 1800’s and later, specifically after Lagers had begun spreading in Europe, they came with the German immigrants who came to the America’s. And while they were slowing spreading across the European landscape, they transformed a bit and blossomed in the Americas. The different barleys used, the addition of adjuncts like rice and corn, which was plentiful in America, and the lower hop levels made this lager a style all it’s own. And it began to spread pretty well, though traditional ales and lager styles were still in existence. It wasn’t until the dark days of prohibition in the early 1920s, when all beer brewing ceased, that lager got it’s chance to take over the American landscape. During the three years that prohibition was enacted most breweries were unable to keep their businesses going. The only ones that did were the larger ones who could adapt their businesses into producing other products. These same breweries came back into service when prohibition ended and the dominance of Pale American Lager began. 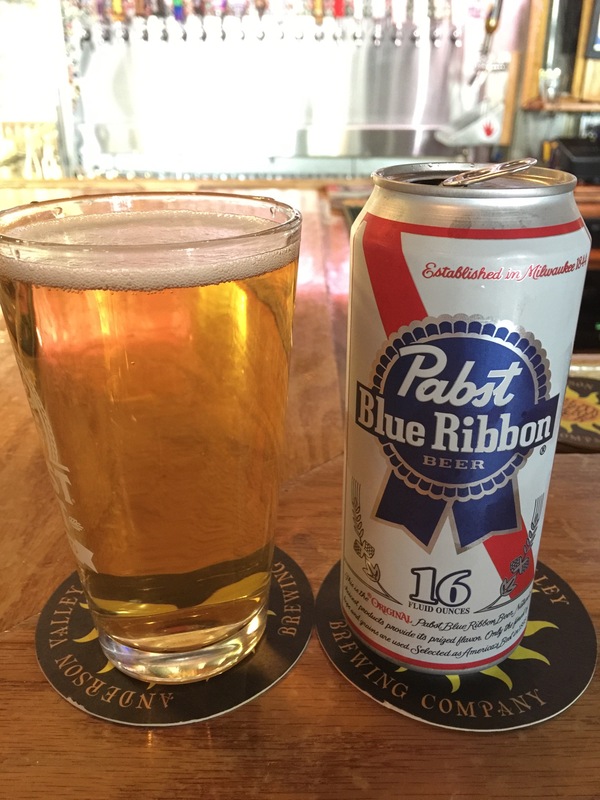 For almost 100 years, the American Beer scene has been dominated by Pale Lagers. Whole generations of Americans lived and died not knowing that other beers had ever existed in America. And the large brewing companies not only specialized in brewing lagers, they also began specializing in marketing their products. So much so that other American industries started using their marketing tactics to push their products onto the public. In 1978, President Jimmy Carter signed a law allowing homebrewing to expand, which opened the door for a whole new generation of entrepreneurs. Before then there were only 89 breweries in the US. Now, there are over 7,450 breweries in the U.S. The majority of that growth has been in the last ten years. The growth of Craft or Independent Breweries has not been without consequences. While craft has been growing by leaps and bounds, and capturing more of the market. The larger Macro breweries that took over the American beer market have been losing ground. They have not only seen no growth but are losing customers. This had led to various clumsy attempts at creating their own craft styles beers which has generally failed. When that didn’t work they began investing in or buying out whole smaller craft breweries to try and recapture the market. That has had some small success with the craft drinking public who were unaware or didn’t care so much. But those in the know have raised a voice ringing throughout the beer landscape. Craft brewing doesn’t work as well under the Macro Beer business structure. Craft brewing isn’t about profits maximizing profits with lower quality ingredients. It’s about maximizing quality with by experimenting with ingredients and processes and being agile enough to change with the customer demand. Macro cannot handle that. Now that you have had the layout of the landscape explained to you, perhaps your navigation through the quagmire that is Craft Beer will be easier. Perhaps you are concerned about who makes your beer. Or perhaps not… If you aren’t and you are more than satisfied with the fallacy of beer that has been pawned off on the American public for the last 90 plus years then I hope you enjoy what you are drinking. If, however, you are like me, and your mind and your taste buds have been exposed to wonderful array of aromas and flavors that make up the products of Independent brewing, then please join me in support your locals brewers. 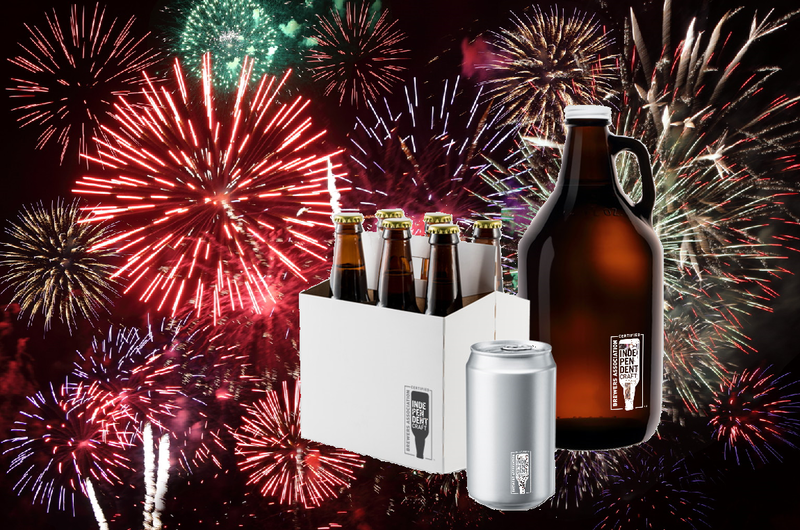 Stop by the local tap room/ tasting room, walk past the cheap section of the beer aisle in your local store and continue to support the newest American entrepreneurs in their efforts to give us back what we lost. How’s that for a title with a double entendre? Am I talking about the shelf life of any craft beer or am I referring to the lifestyle of a Craft Beer Afficiando? My response is… Can’t we do both?! Let’s discuss the former first and get it out of the way. If you don’t know what Pasteurization is the go here: https://en.wikipedia.org/wiki/Pasteurization . If you are familiar with Pasteurization then you may or may not know that most bottled and canned beers, at least those brewed by the big Macro Beer companies, go through a pasteurization process. This is done so that the beers can sit on a shelf in a stores somewhere longer than they normally could without the process, and can shipped over greater distances. Beers stored in kegs are intended to be consumed faster and therefore are not pasteurized. Another reason that a lot of craft brewers do not pasteurize is that many of their beers in bottles are bottle conditioned. The beers go through a secondary fermentation process in the bottle. Pasteurization would kill that process. Also, craft brewers don’t make a lot of excess beer and their market share is more local and smaller. Their product is consumed faster so the need for pasteurization is not as great as it is for Macro brewers whose product can sit on a store shelf for much longer periods of time. Non-pasteurized beer will also retain a lot more healthy pro-biotics and nutrients that Mr. Pasteur’s process will kill off. 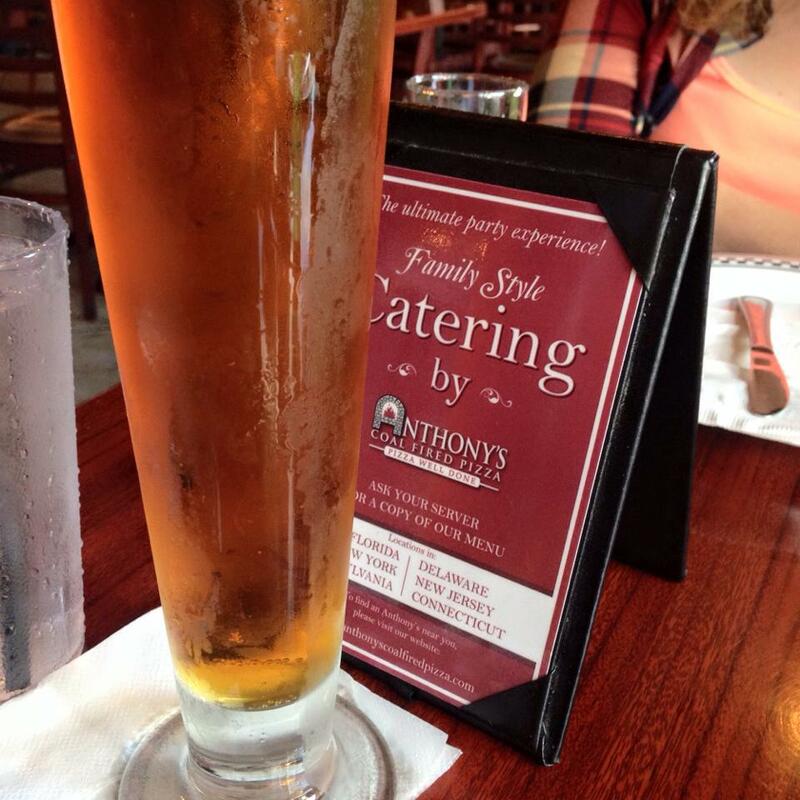 So be an informed supper of suds and choose the beer that best fits your needs. Which leads me to the second part of this epistle… the Craft Beer Life… as in lifestyle. Just for clarity’s sake this is not a reference to the Facebook page of the same name. Which from what I can tell has had no activity on it in a couple of years. This means are you living a lifestyle that revolves around Craft Beer? Is it just a passing fancy for you or is Craft Beer your go to beverage of choice? Do you shun Macro Manufactured beers whenever you see them? 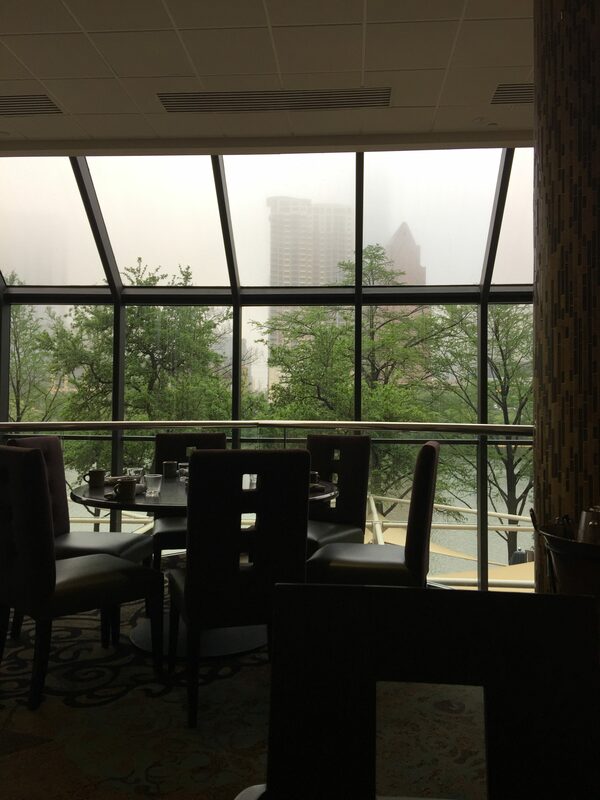 Example: I recently visited San Antonio, Texas, for a work-related conference. The first night included a reception where you could mingle with others and network. The beverages beings served were soft drinks, wines and beers. The beers being offered were Bud Light, Miller Light, Coors Light, Corona Light, Michelob Ultra and Shiner Bock. 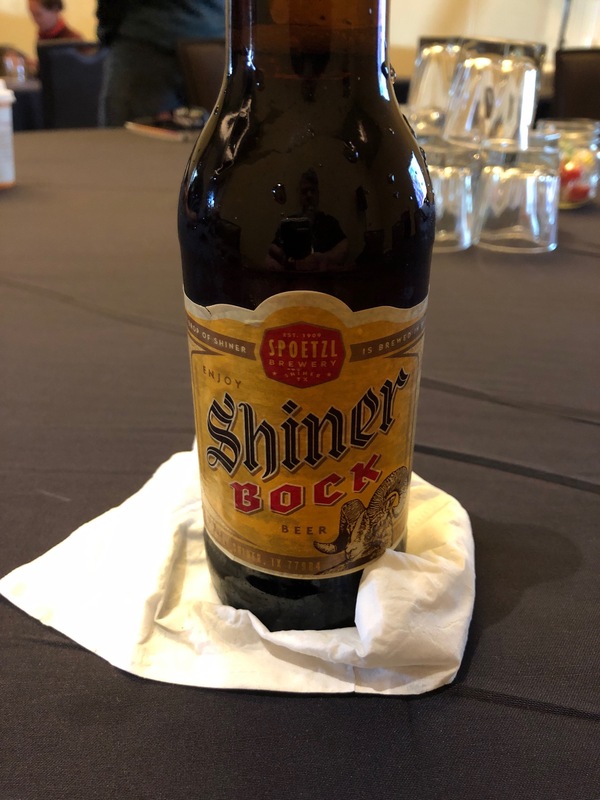 If you are living the Craft Beer Life then really the only beer there was Shiner Bock. Coincidently, a little later one of the beverage bars brought out a locally brewed IPA which I switched to after the Shiner. 1. Do the employees at the local craft beer establishments know your name? 2. Do you attend more than one Craft Beer Festival in any given year? 3. Do you plan vacations or weekend trips around craft breweries or craft beer bars? 4. 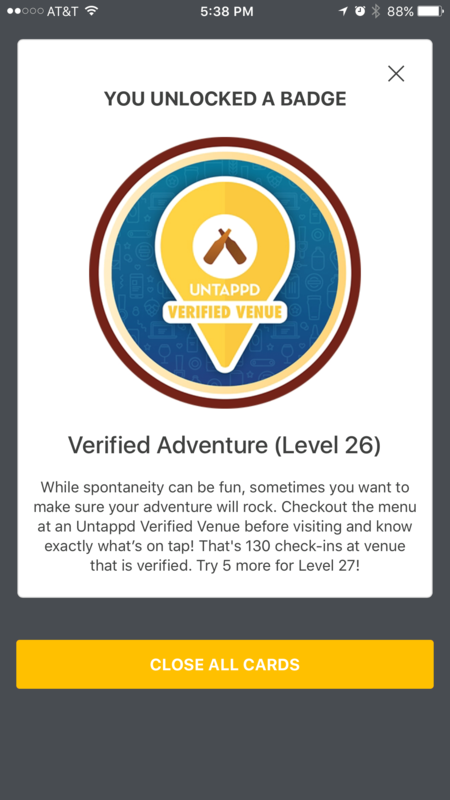 Do you have an App on your phone for tracking your beers? 5. 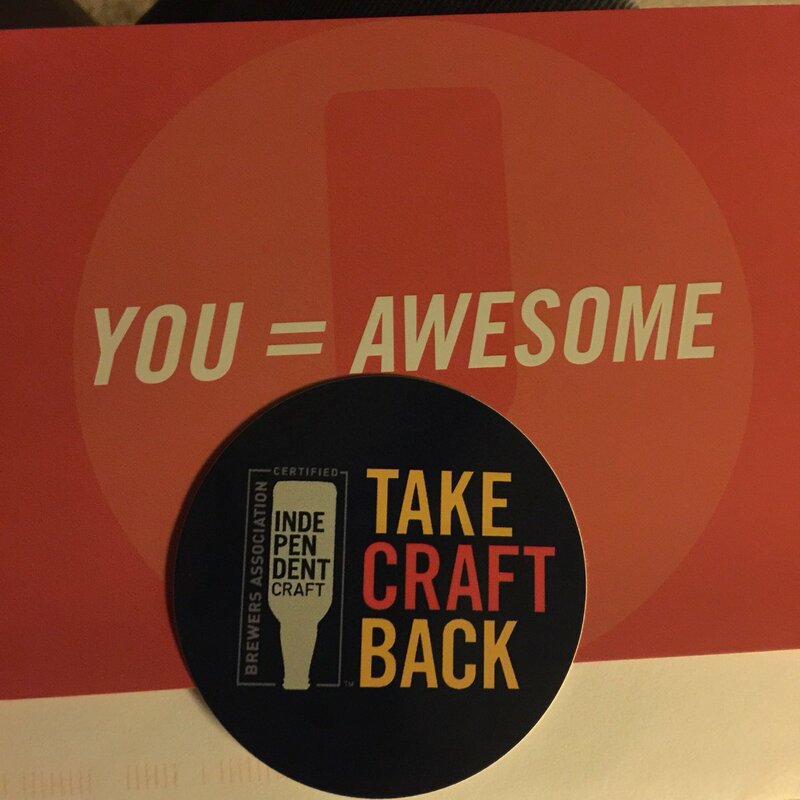 Do you buy or get free craft beer swag on-line, at bars, breweries or craft beer festivals? 6. Do you work at a Craft Brewery? 7. 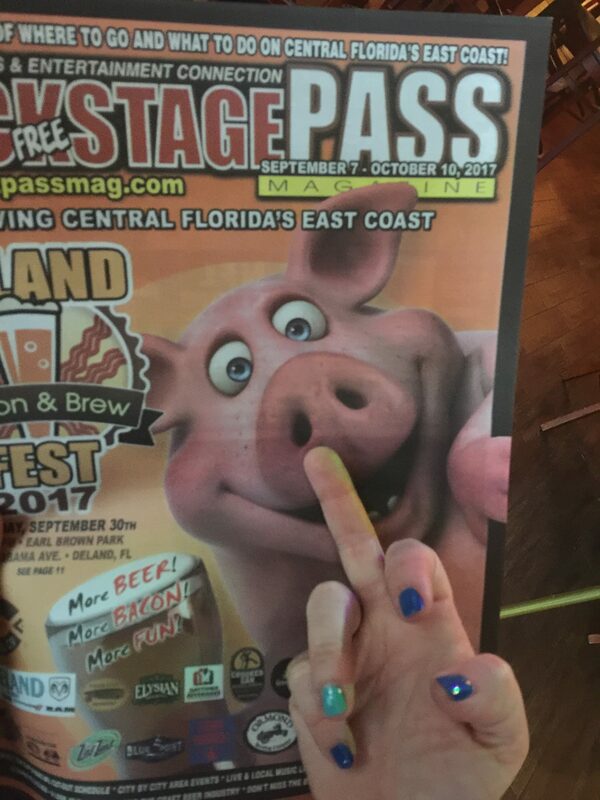 Do you subscribe to any Craft Beer related magazine (ex. – Craft Beer & Brewing)? 8. Do you own multiple styles of beer glasses so that you can drink any beer in it’s proper serving container to get the best taste profile from it? 10. 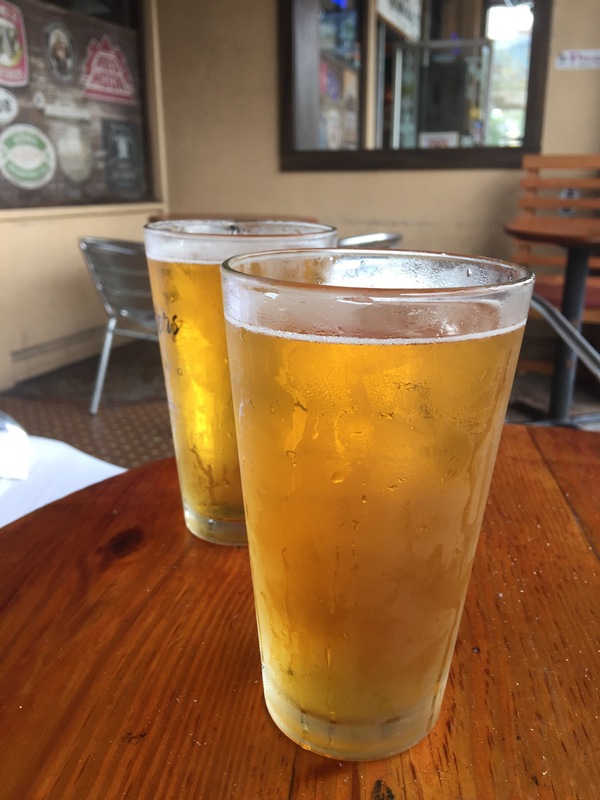 Can you tell the difference between a Pilsner, a Pale Ale and a Lager just by taste? 11. 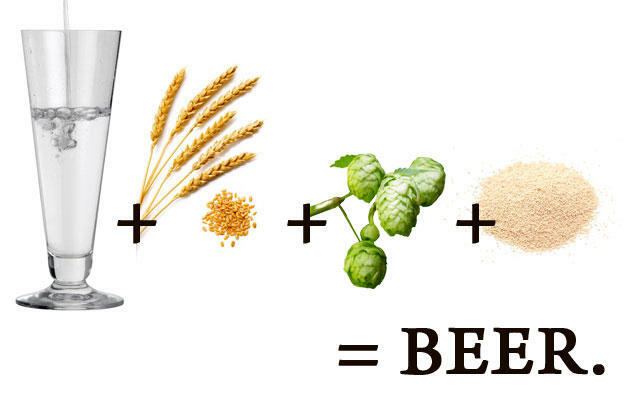 Do you brew your own craft beer? 12. 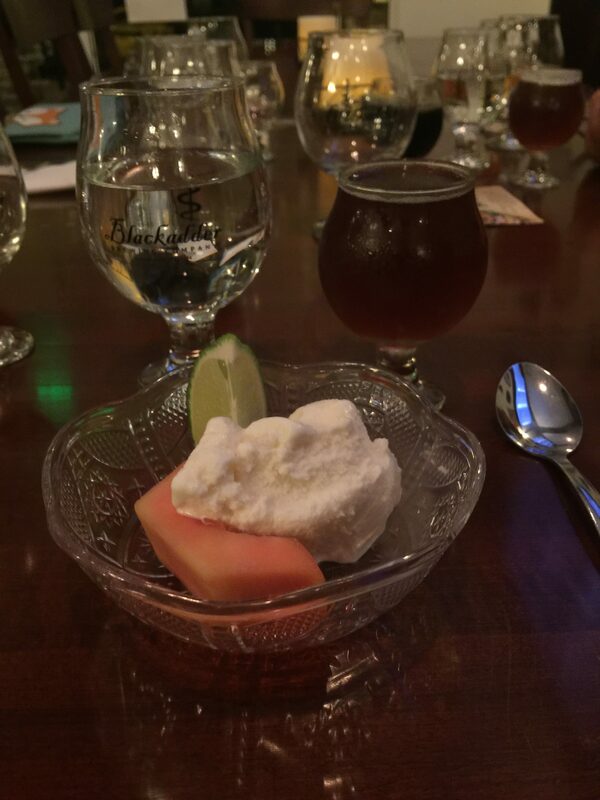 When someone uses the words Brettanomyces, Wort, Spurge, or Barrel-Aged do your ears perk up? 13. 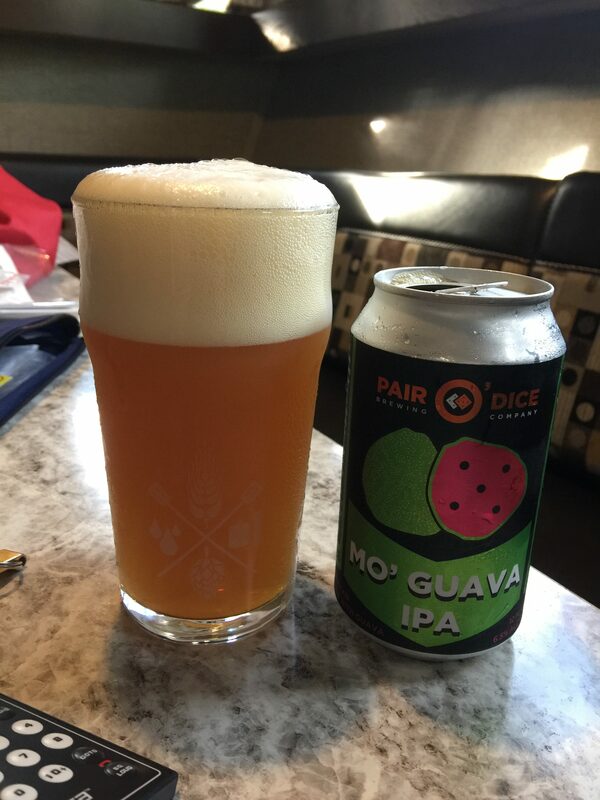 Do you and your friends swap craft beers that you pick up on trips? 14. 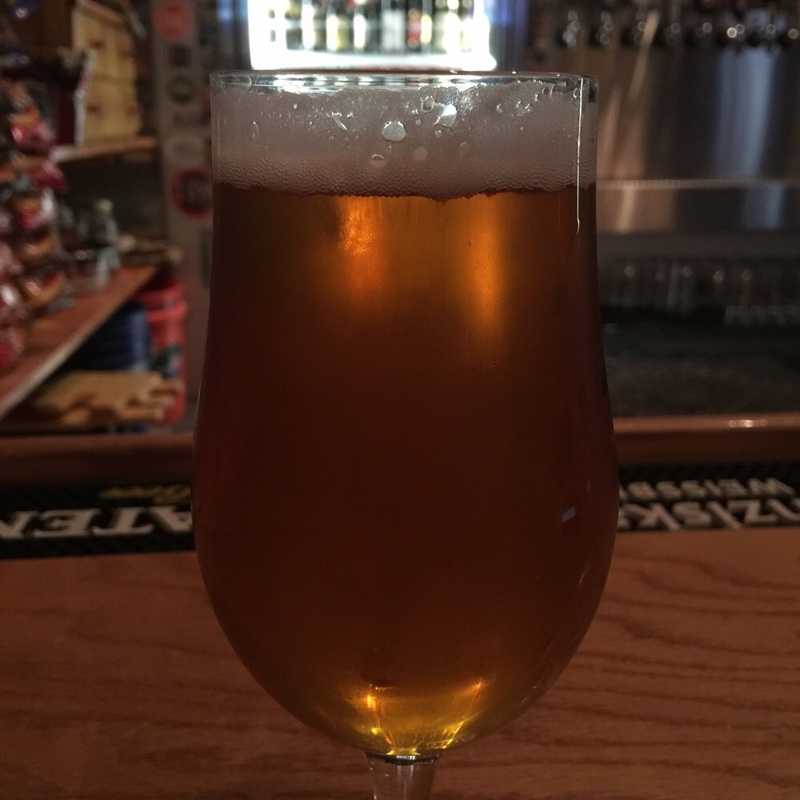 Do you write a blog based on Craft Beer? To be honest, the first two could apply and you may still not be living the Craft Beer Life… you may be just a college kid or an alcoholic. And number six is not a prerequisite. But to be honest if you are working at a craft beer brewery and your not living the craft beer life then what the hell are you doing there??!! Just an FYI – Except for number six I answered yes to all of them. But I do have plans to cross that one off the list someday. 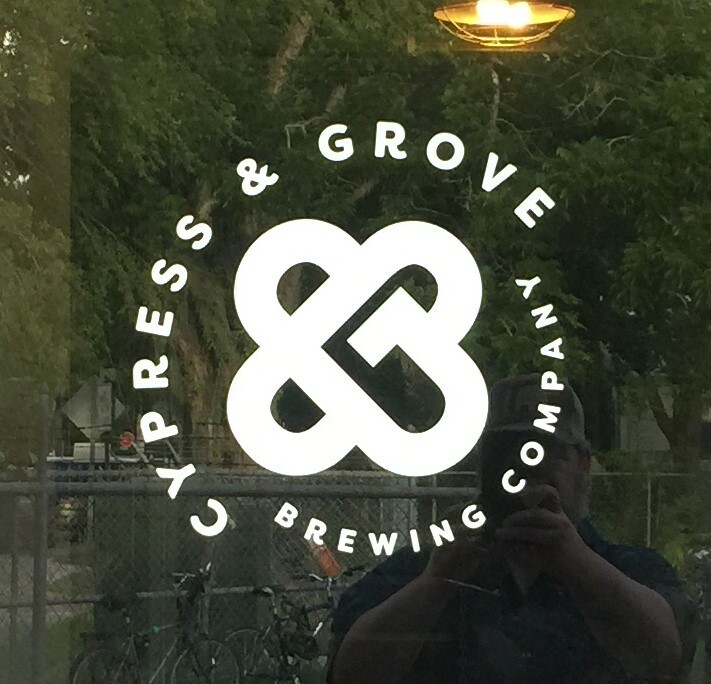 For all of you out-of-towners who may not have been to Gainesville before, the following is a listing of Gainesville locations for Craft Beer. I will break it down by breweries, craft beer businesses with food, and craft beer bars. FYI – The order that I am listing them in is not indicative of any preference. 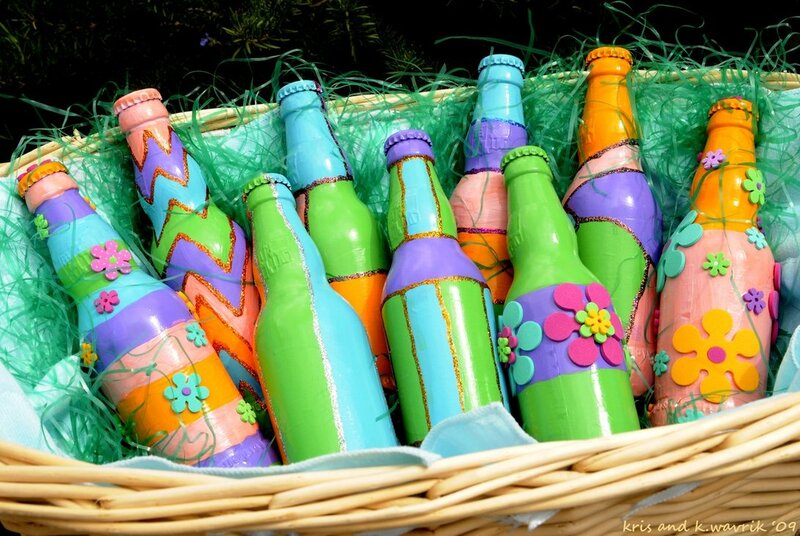 Besides as with all things craft… your taste vary. If you’ve never been to Gainesville before then you’re in for a treat. While we may not have a lot of breweries, the ones we do have been bringing home medals from state and national events for a few years. So while the quantity of breweries may be low the quality is way above the normal. 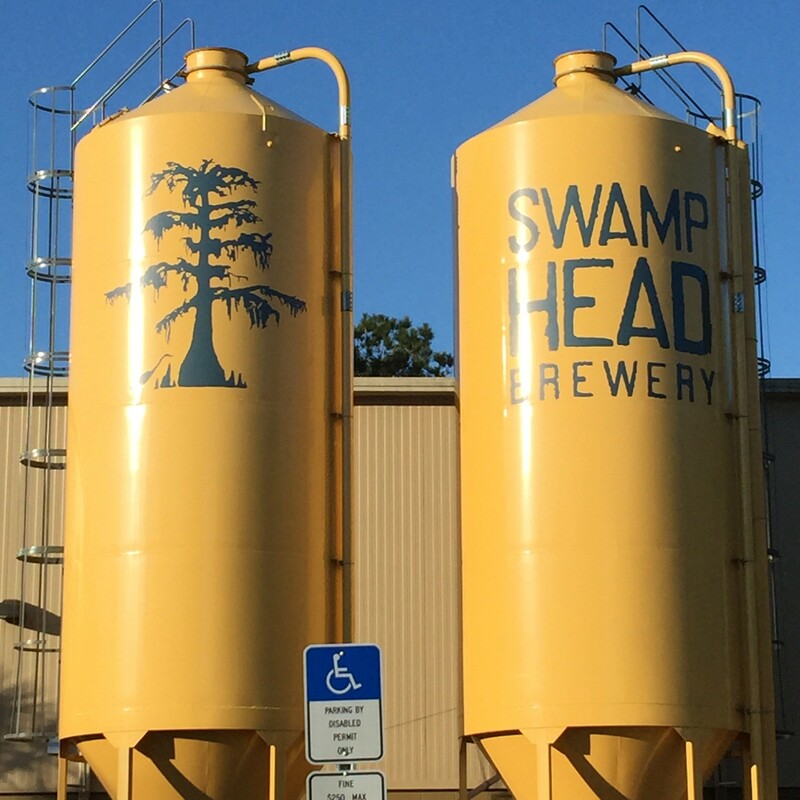 Swamp Head Brewing – This is the Big Daddy in this town. They were the first production brewery in Gainesville and have brought home both national and state medals for their ales. Located of off south 34th Street this place is the largest brewer in Gainesville. 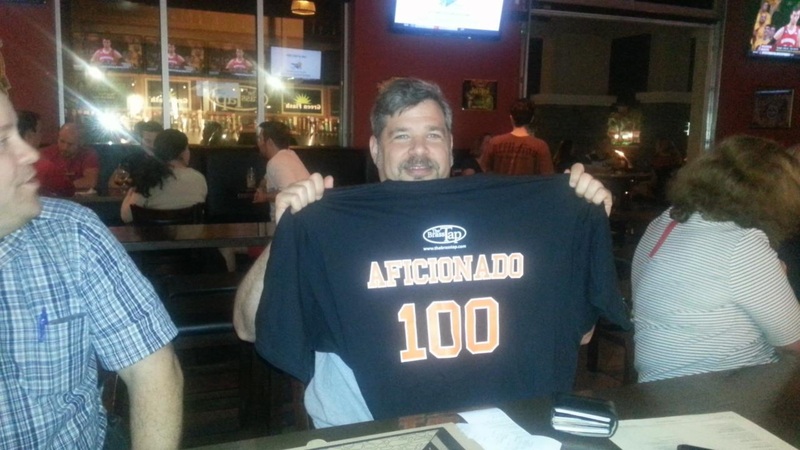 They started as as the only large scale brewer which was an innovation in Gainesville. Then they kinda of tapered off on the innovation until the last year or so. Now they are putting out really good experimental styles. As well as their flagship ales. 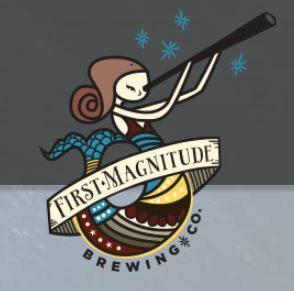 First Magnitude Brewing – Two local couples started this brewery with the idea that the springs in north central Florida were of the First Magnitude in quality water. 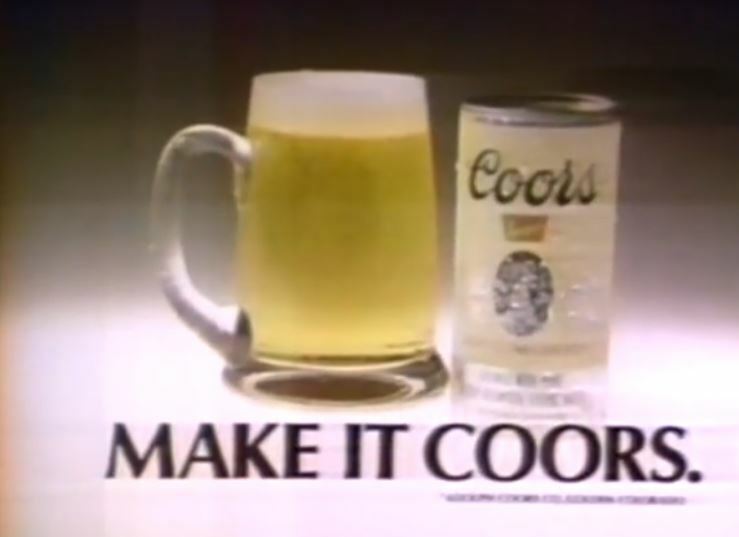 They carried that idea of quality into their recipes for beer. They have also been bringing home medals at both the state and national levels for a few years. Where Swamp Head started out as hop heavy and varied on that, First Mag came at it from the style of the beer they were making and focused on making it the best of that style that they could. 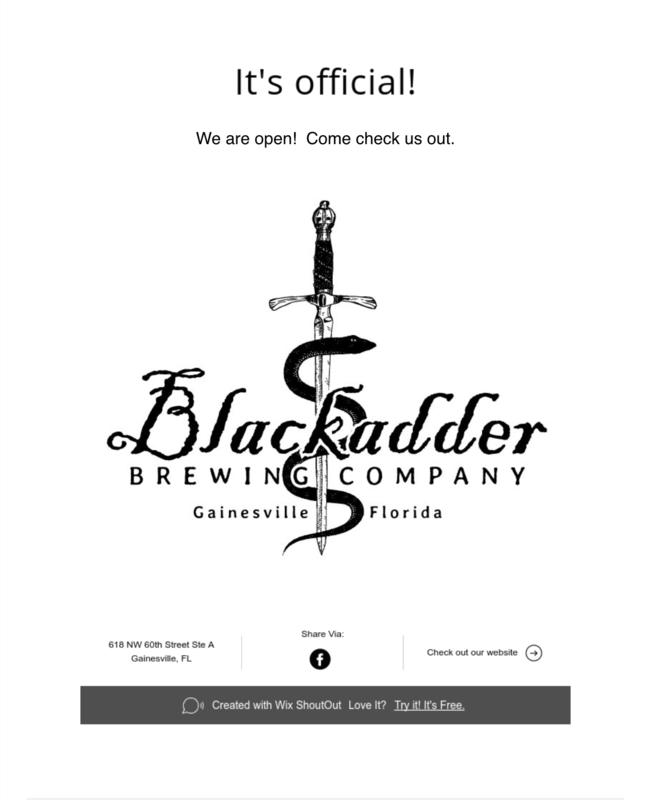 Blackadder Brewing – Unlike the first two listed, Blackadder is not a production brewery, they don’t do canning and only bottle limited releases. Their primary business is as a microbrewery/pub. But they do that very well. 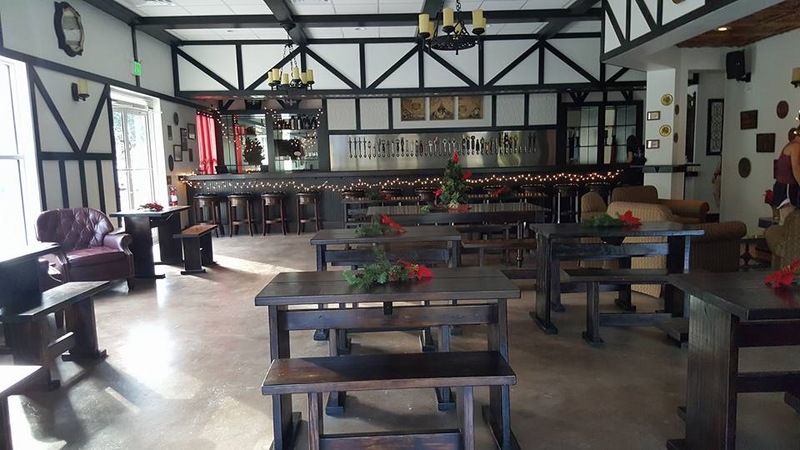 The pub has been modeled after some olde style English pubs, certainly an influence from Chris and Cissy’s adventures to beer breweries and pubs in Europe. They brew they own ales, usually having 8 on tap and many of them in a Belgian or German beer style, and also feature over twenty other taps of guest beers which are always from a very good quality brewer. 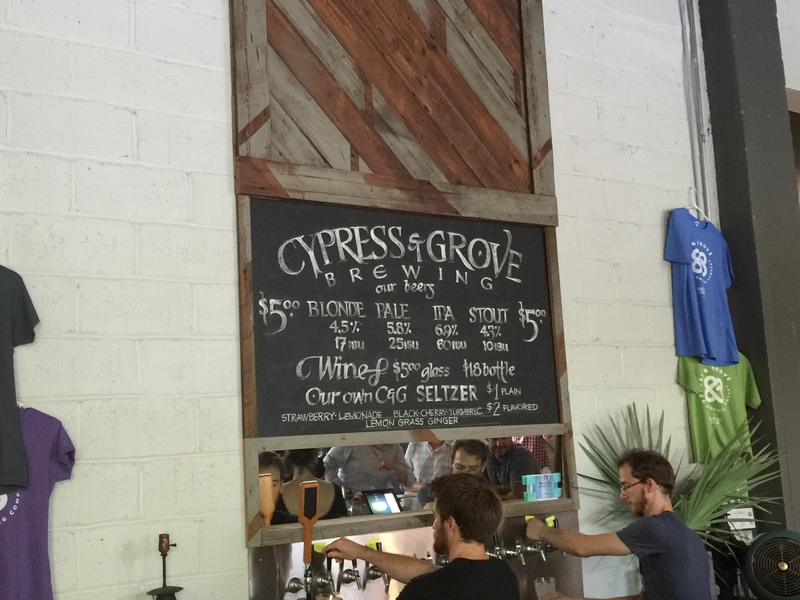 Cypress & Grove – The newest homegrown brewery in Gainesville has actually moved into an old abandoned ice house where large blocks of ice were shipped to back before refrigeration came into being. They started out slow with a half dozen flagship brews, of which I thought their Porter stood out. They have since had some very good examples added to their line-up. All of these are great examples of homegrown craft beer. Warning: none of them have kitchens for food preparation but there is almost always a food truck or two on sight. 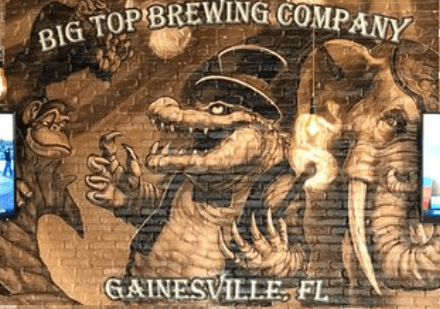 Big Top Brewing – This company started in Sarasota and have now expanded to Pensacola and right here in downtown Gainesville. 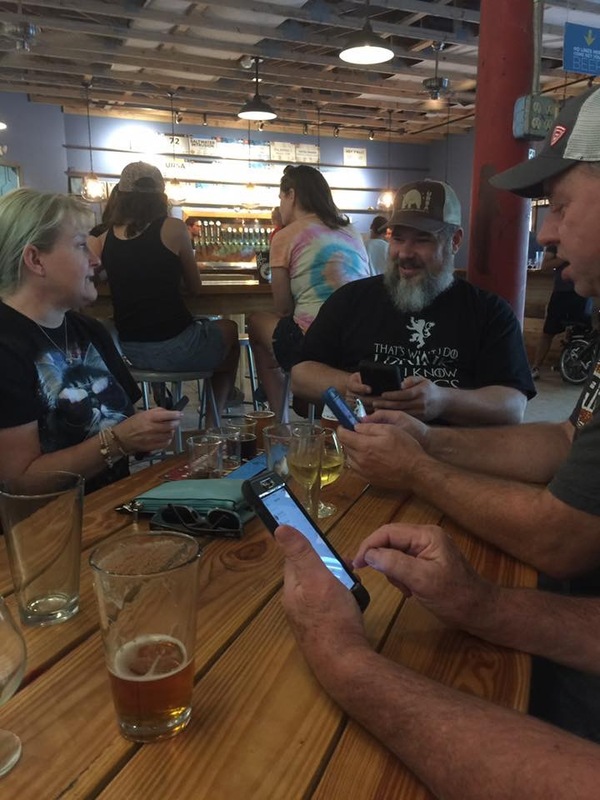 When they first opened they were limited to the beers brewed at their Sarasota location and shipped to them but they have recently gotten all the papers approved for brewing to commence in Gainesville. So some of the beers at the local location will only be available there. 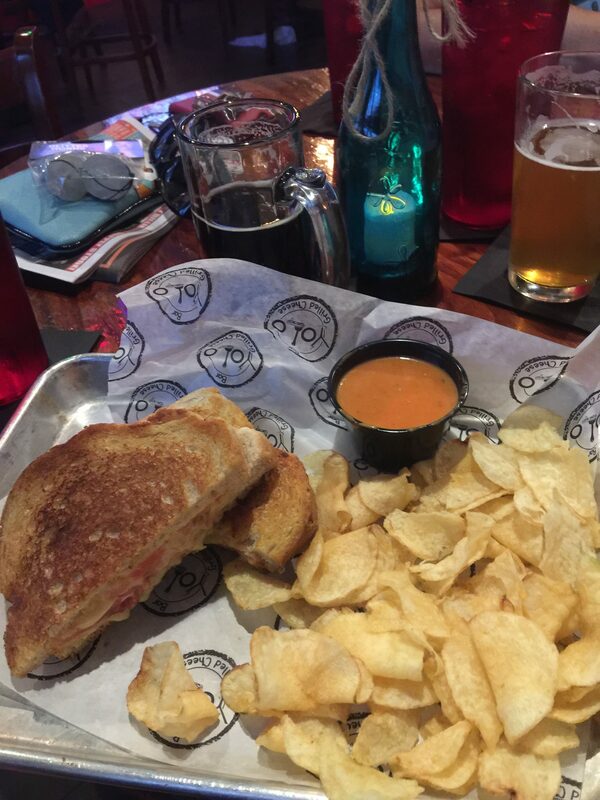 This brewery also serves food. And their are unique spin on some old bar food classics are worth sampling. I will break this out by those who do and do not serve food. And I will also only include those that I have been to as I can’t honestly recommend a place I haven’t visited on my own. 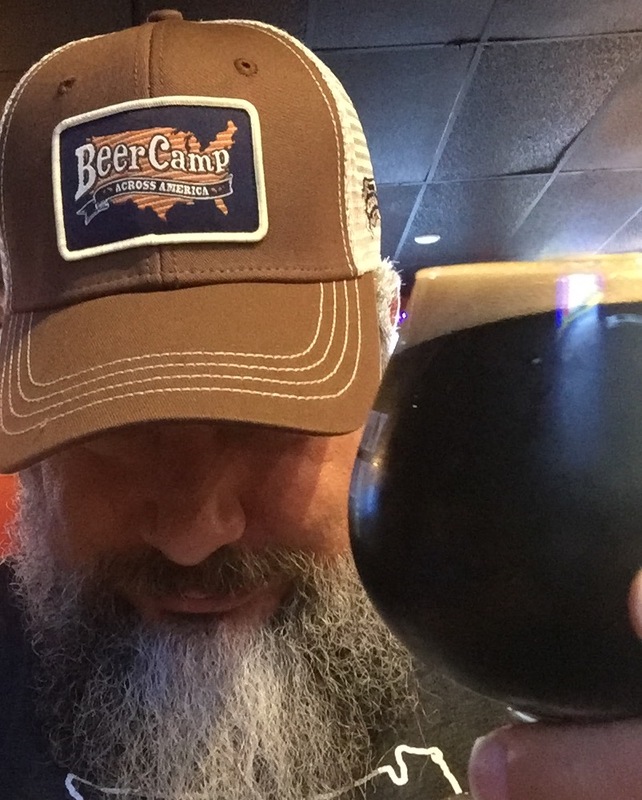 And while there a quite a few restaurants in Gainesville that have some of our local breweries on at least one or two taps, I will focus more on those that have multiple taps of CRAFT beer. So for all of you Bud Light/Miller Light/Coors Light drinkers… You’re on your own. The Top – It isn’t the name that puts them at the top of the list (pun intended) that is purely coincidental. 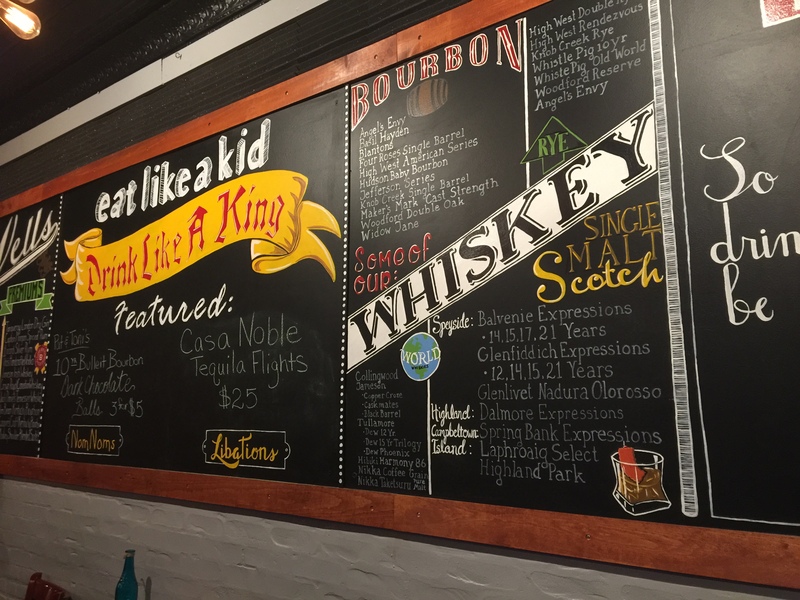 They are one of the oldest existing businesses in Gainesville that have a really great selection of Craft Beer and they have some of the best food menu items available. Not to mention the uniquely Floridian décor and the great service this place is one I always enjoy visiting. 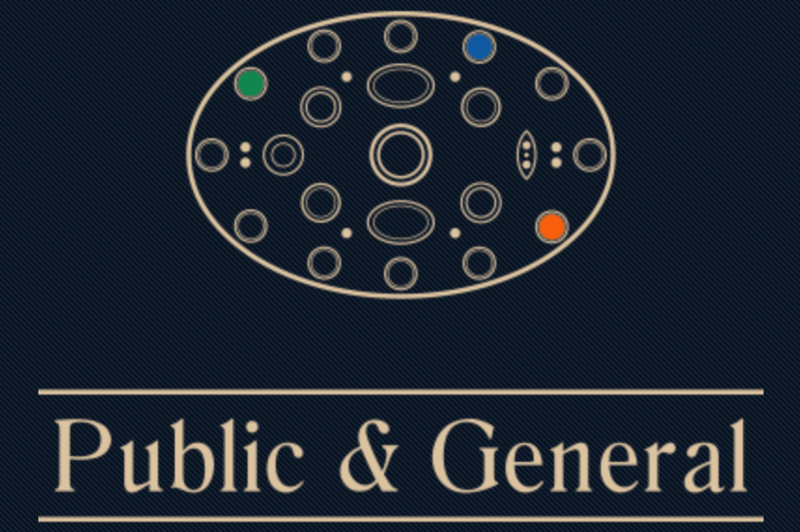 Public & General – A little hidden gem in the northeast part of Gainesville, and probably the closest to the Hoggetown Beerfest location, is a little pub called Public & General. I like to frequent this place at least once a week for lunch but I also occasionally make an early evening visit there. While the among of taps is not as vast as some others the ones they have on tap contain really good beers. And they have a great bottle selection to choose from as wellas some great wines. The menu is limited but the selections on it are great and flavorful. 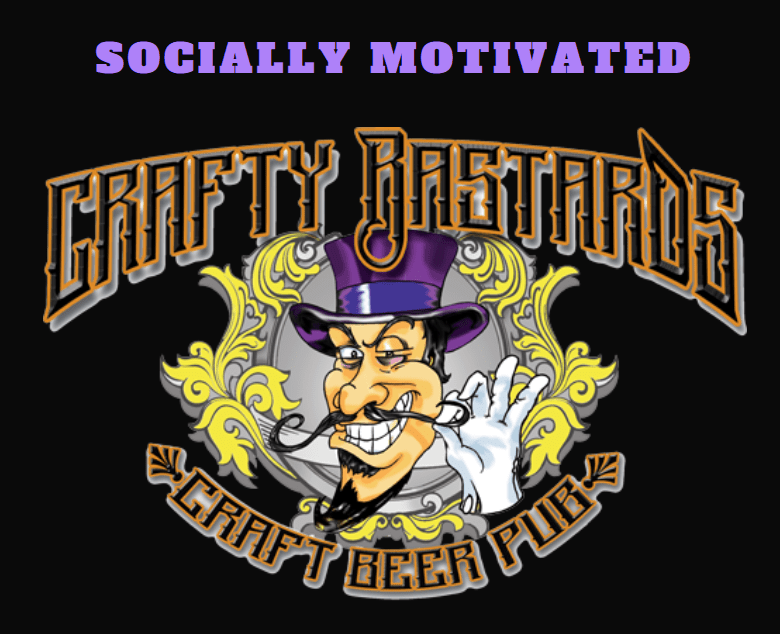 Crafty Bastards – This establishment is only a few years old but features a great selection of craft beers both on tap and in bottles. 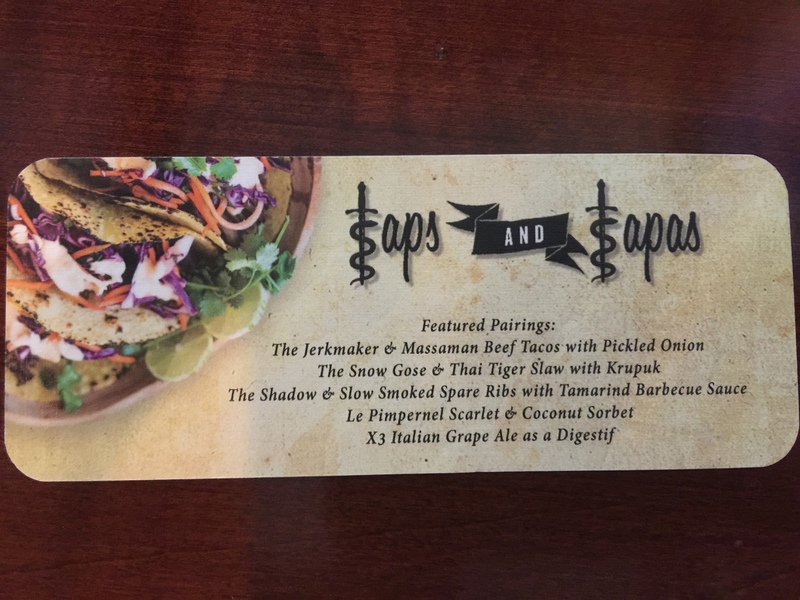 Their food selection is pretty good and you will find some original recipes from the area. They rotate the tap selections frequently and I can honestly say I haven’t had a food dish there yet I haven’t liked though I haven’t had them all. 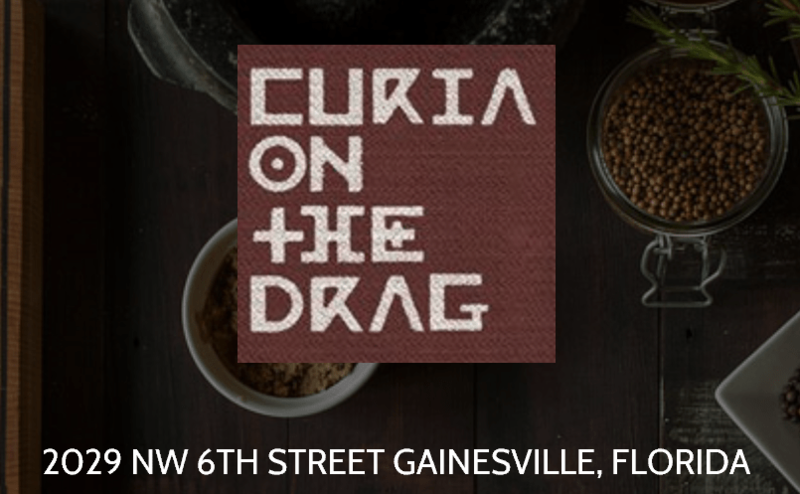 Curia on the Drag – This little Curious collection of unique bric-a-brac, coffee shop, diner, and craft beer is something that needs to be seen. Especially if you like kitschy décor and flavors. I haven’t been there in a while but I keep hearing goods things and think I need to go back soon. 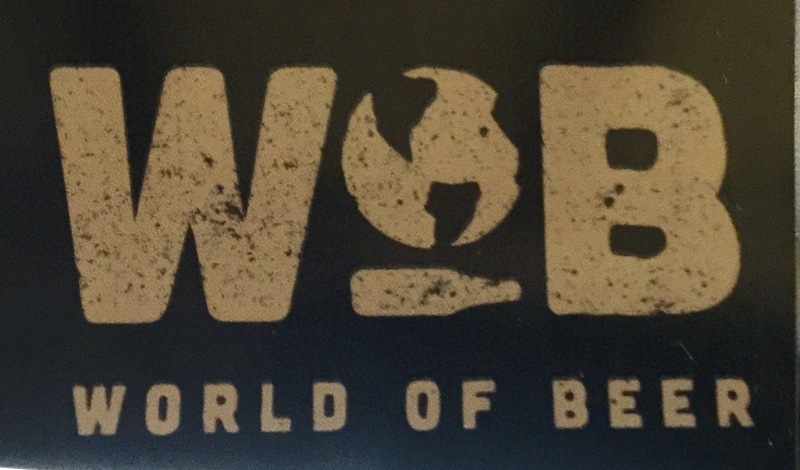 World of Beer Gainesville – They have a wide selection of craft beers though I do see some influences from the ABInBev distributor. The last time I went it didn’t seem like the tap rotation was that frequent. But it has been a while since I have been there. The food selection is fairly good and it’s the only place in town (that I know of) where I can get Schnitzel. It isn’t the greatest Schnitzel I have ever had but it will do until I can perfect my own recipe or find someone better. The next three are local Pizza places I have included because not only do they carry craft beers on their taps they also have great food menus. 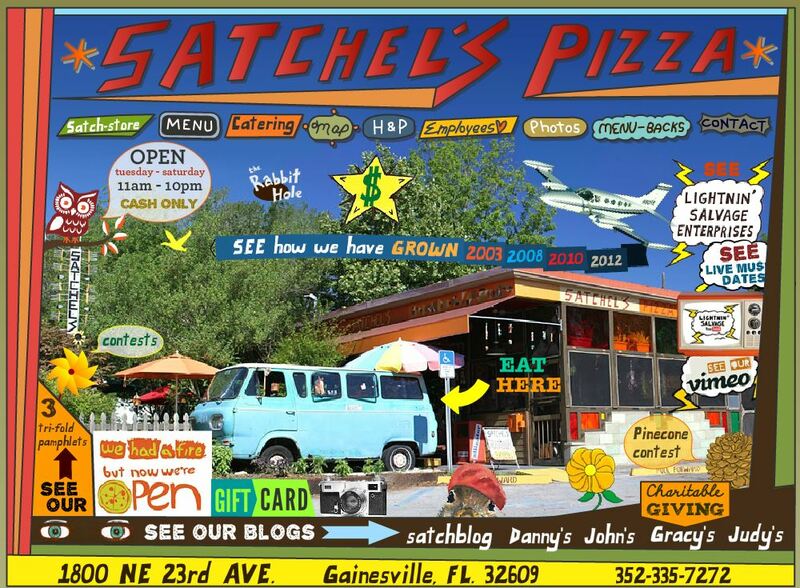 Satchel’s Pizza – A fire wiped Satchel’s out for a brief period a couple years ago, but they have come back better than ever. They served fresh made pizzas with Satchel’s own tomato sauce which I love because it has just a slight hint of spice in it. I also am a big fan of their house salad. If you get the chance try both. I can also recommend the Calzone and they have a great wine selection as well. Oops! !… I almost forgot to mention the back part of Satchel’s – Lightning Salvage where you can find many paraphernalia that will remind you of your childhood. And they have local talent playing on the back bandstand. Satchel’s is the only place I have ever been where the dessert menu is brought out to you on a ViewMaster 3D viewer for you to choose from. If you have to ask what a ViewMaster is then you can move along now. 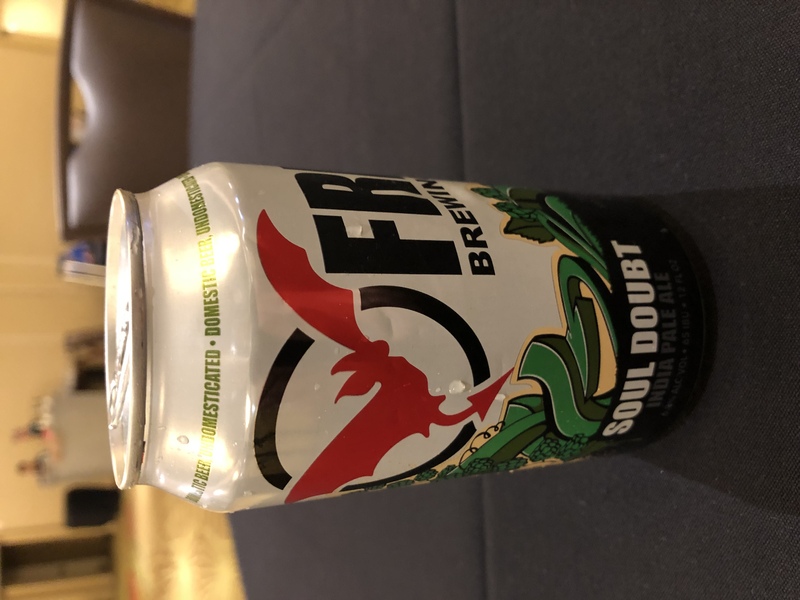 Great section of craft beer featuring Florida beers, but be forewarned that the draft beer selection inside the restaurant and in the Lightning Salvage area are sometimes different. 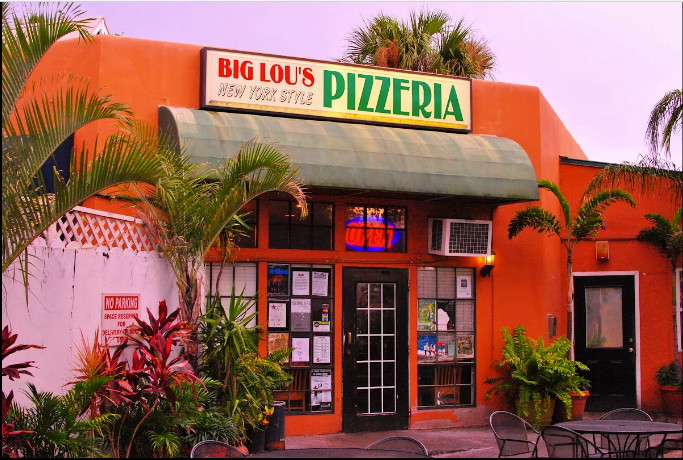 Big Lou’s NY Style Pizzeria – The name says it all, NY style pizza with a classic marinara sauce and your choice of toppings. They also have other Italian dishes, excellent salads and garlic rolls. Great wings and sandwiches and a centrally located venue in downtown. One of my favorite places if I am working downtown at lunch time. And at night they carry a good selection of beer both on tap and in bottles. V Pizza – Another option for downtown they have stone fired pizza as well as a good salad selection and great wings, but they also have a lot of other selections on the menu which I haven’t tried yet. Nice crispy crust and a good selectin for toppings for both their pizzas and calzones. Now I will includes some other really good restaurants that also serve craft beer. Dragonfly Sushi – So you should guess that this is a Sushi place and they have some really great food. They also have a decent craft beer selection but more importantly they have a wide variety of Sakes, which in my mind is a craft product that deserves much more attention. This place definitely deserves a visit if your in a Sushi frame of mind. Ker’s Winghouse – Located on Archer Rd, this is what some would consider a Hooters clone, though I think the food is better. This location currently runs 15 beer taps and about 8 are holding craft beer, and four of those are local.The craft beer selections are actually pretty good. If you’re looking good wings and sandwiches, a decent beer list and a wait staff dressed to please then this is your place. Hogan’s Great Sandwiches – If your in the mood for a great sub, then you have to stop at Hogan’s on NW 13th Street. 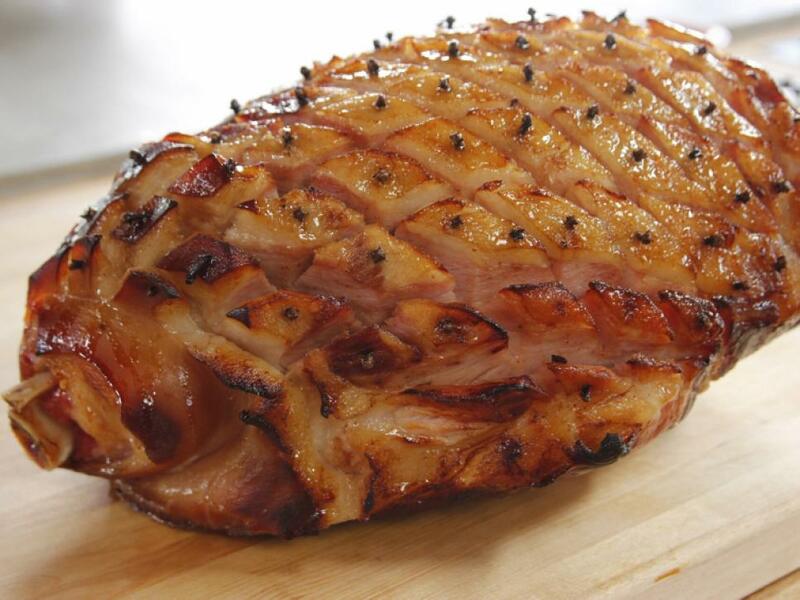 Great deli meats and cheeses and of the best add ons loaded into great bread. This place has the best subs in town, in my opinion and they have a little bar at the back called the Fallout Shelter (the original name of the business was “Hogan’s Heros” which of course was a play on the 60s TV show about WW2 POW commandos – thus the name of the bar) that serves along with some Macro brews and good selection of craft beers. Miller’s Ale House – I list this one reluctantly because it is a popular spot. But my reluctance is due to the fact that several of their beers they have identified as “Craft” may have started out that way but now they have been bought out by ABInBev. They do have some independents who have bigger brewing power, like Sierra Nevada and Sam Adams, but in my opinion it’s not a craft beer restaurant. However, depending on the dish the food can be pretty good. Your mileage may vary. Now I will give you a short list of bars that specialize in Craft Beer but do not serve food. However, they are okay with your bringing your own food in if you desire. But then you could just go there for a good drink. 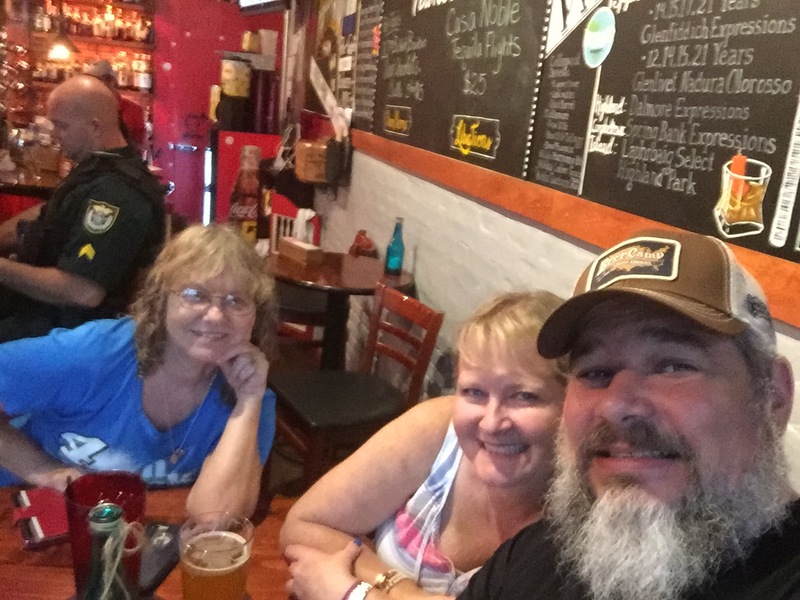 Gainesville House of Beer – If you have been reading this blog at all then you know that I frequent this location a lot. They keep a good rotating tap going and the downtown location for me is really convenient. The staff are very knowledgeable and if you visit frequently they learn what your likes and dislikes are over time. They also have their own line of craft beers brewed at their original location in Dunedin, which is then shipped to Gainesville. They usually have a pretty good showing of Florida beers. 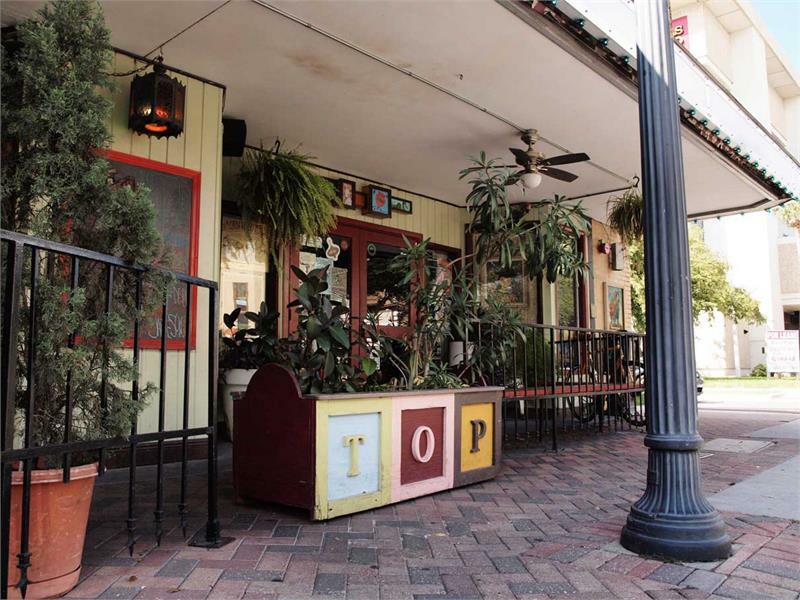 Hop Top – This place is one of those little hidden gems that locals know about but may not get a lot of business if it weren’t for word of mouth. Not a grandiose location but what they do have that is great and keeps getting better is a great selection of craft beers both on tap and bottled and the taps rotate fairly frequently. The staff that I have encountered know the product pretty good nd have been fairly helpful it guiding me to a good tasting craft beer. There are other restaurants and bars in town but their beer selections are often one or two craft beers and some high end Macro Beers so they can charge more. 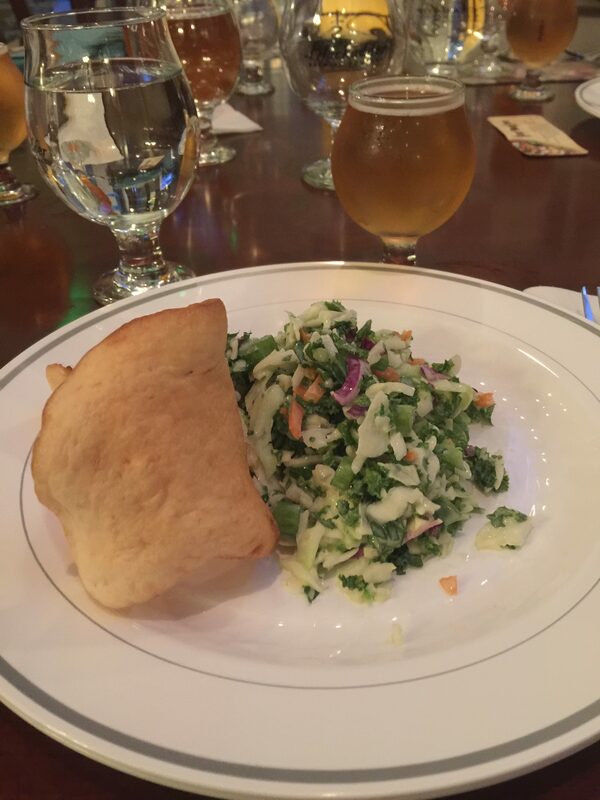 They will have delicious food and then serve it with ordinary beers. That can be a crime in my book. And the wait staff’s knowledge of these beers is hit and miss. If you’re lucky you get a waitperson that has knowledge of craft beer because they like it themselves. If you find something you like I haven’t mentioned in here then let me know so I can investigate. A little bit of sad news. If any of you are looking for either Tall Paul’s Brewhouse/Alligator Brewing or Brass Tap, I’m afraid both those businesses have closed. The reasons why have been speculated on but all I will say for certain is that we lost two great resources of craft beer. Hopefully others can fill their place. Back when the Craft Beer movement was in its infancy and the possibilities endless, there were many folks who dreamed of making their love of beer into a business. Luckily, for us, a lot of them succeeded. There are currently more breweries in the United States then there have ever been. That is actually no small feat. 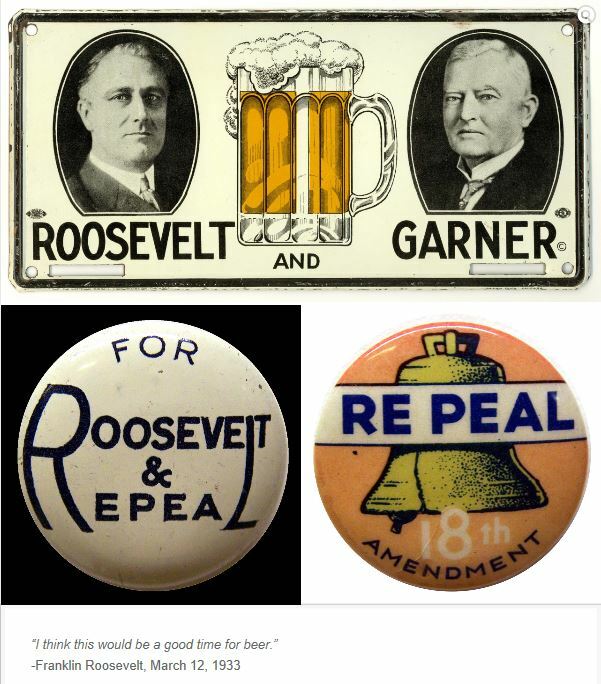 Almost 100 years ago evil-doers succeeded in banning beer production (along with all other alcoholic beverages) in the United States. For 3 long sober years, legal brewing was banned. Eventually the consequences of the mistake made became evident and Prohibition was repealed in 1923. But by then the damage had been done and where we had once over 4000 breweries only a handful were able to recover and start producing again. Those breweries survived by changing their production to something that was legal. They adapted to their environment by changing their business strategy. When Craft Beer started booming around the beginning of the 21st Century, the business strategies that were employed were as varied as the number of breweries. A lot of Craft Brewers started out as Home Brewers. They learned the basics of brewing in their garages and sheds and tried perfecting their recipes there. As their skills improved they would get feedback from folks, usually friends that their creations were good enough to put on the market. So they ventured out and began breweries. Some started small at the microbrewery/brew pub level, some started in the mid-range at a small production level (kegs only), and others started at a more robust level (bottling along with kegs). Not all of them succeeded. 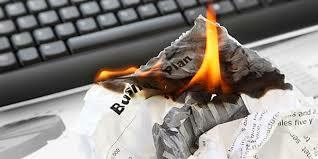 A common factor for all of those who failed was using a bad business strategy, or having no strategy at all. So the need for a business strategy for any brewery, no matter the size, is evident. But as you can see from what happened with Prohibition, the need to be able to adapt that strategy to changing circumstances is also necessary. 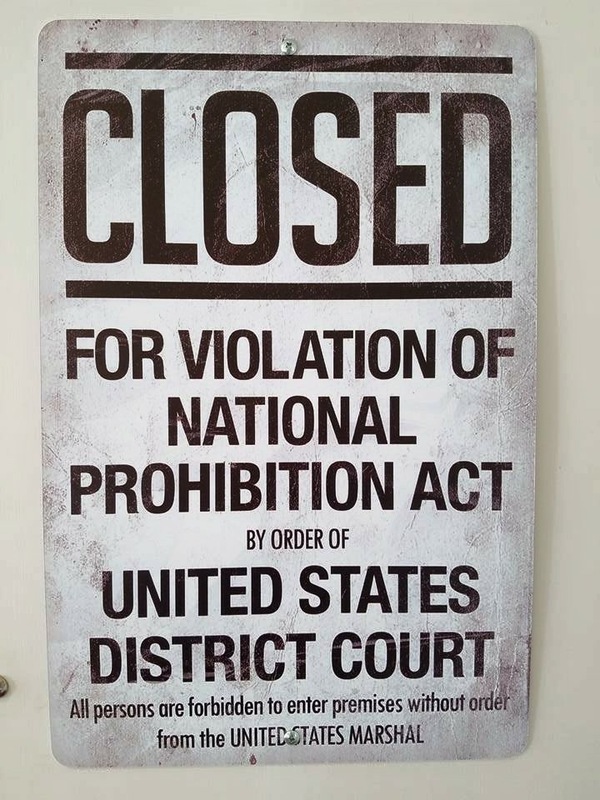 While it is unlikely that Prohibition will come again, at least in our life-time, it is quite possible that some other event that is capable of disrupting the business could occur. And you need to be able to adjust any business strategy to account for growth and expansion. Any strategy you develop needs to be able to address or adapt to changes that can and likely will occur. The following are simple points that need to be addressed with any brewery business, as well as many other businesses, in order to be successful. 1. Capital – No matter what level of brewing you are going to start out at you are going to need funding. You’re not making five gallon batches in your garage anymore. And your friends are no longer your only patrons. You need to be able to produce enough product to serve to patrons. You will need equipment to make that product as well as staffing to not only produce and package it, but also to serve it depending on your business plan. You will need a new location, whether you purchase the property or lease it and that will definitely require some renovation if not brand new construction. 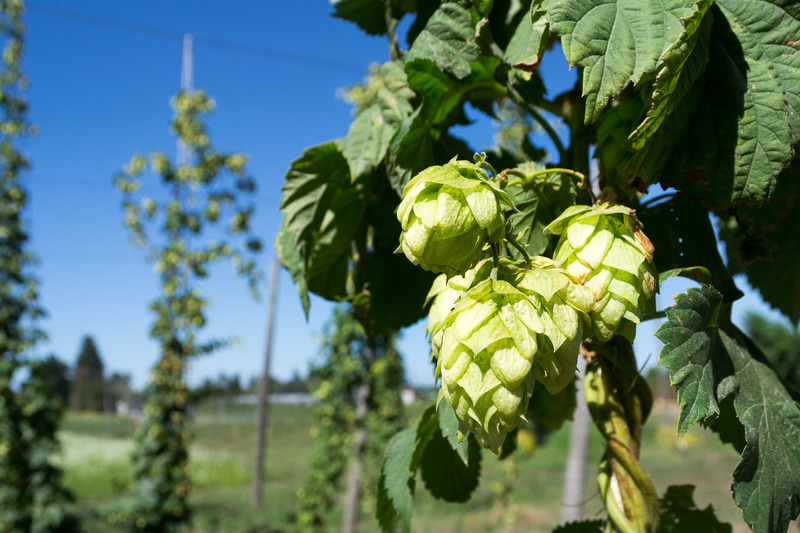 You need to establish a supply chain with Vendors who can guarantee a reliable supply of the grains, yeasts, and hops you need to make your product. All of that is going to require funding to purchase. And you need to be able to sustain your business through at least the first year. Until you can garner a regular customer base and have a steady income from that. 2. 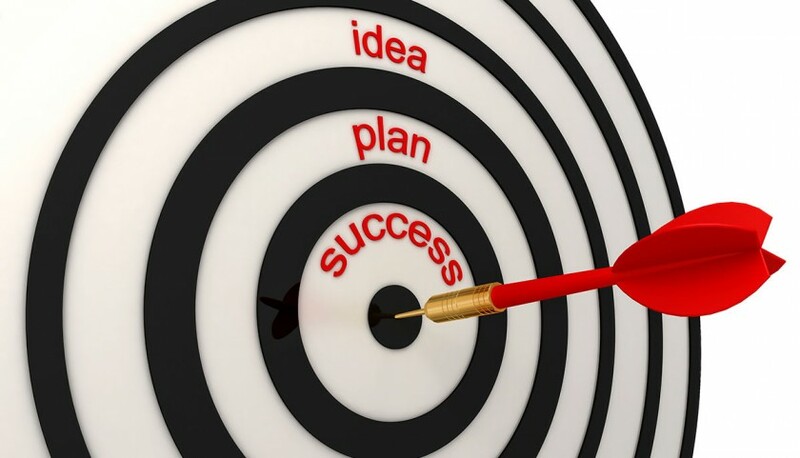 Location – Since you aren’t in your garage anymore, you need to think about what kind of plan you are going to establish and use that to determine a location. Do you want to stay small or do you plan to expand in the future? If you are a production brewery you need to think about truck access. You also need to take into account the water supply to your new facility. Beer is approximately 95% water. 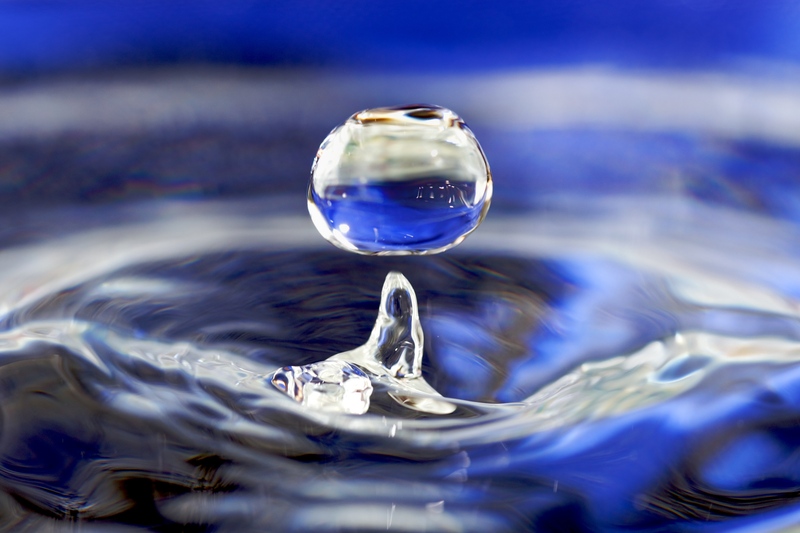 You need to have a clean reliable source of water to make your product. Will it be piped in from a municipality or utility or will you dig your own well? And if you have a serving room or are going the microbrewery/pub route what is a good location for your business? Will it have good exposure in a high traffic setting? Do you have enough parking for your patrons? 3. Economies of Scale – As I said earlier, you are no longer making five gallon batches in your garage. 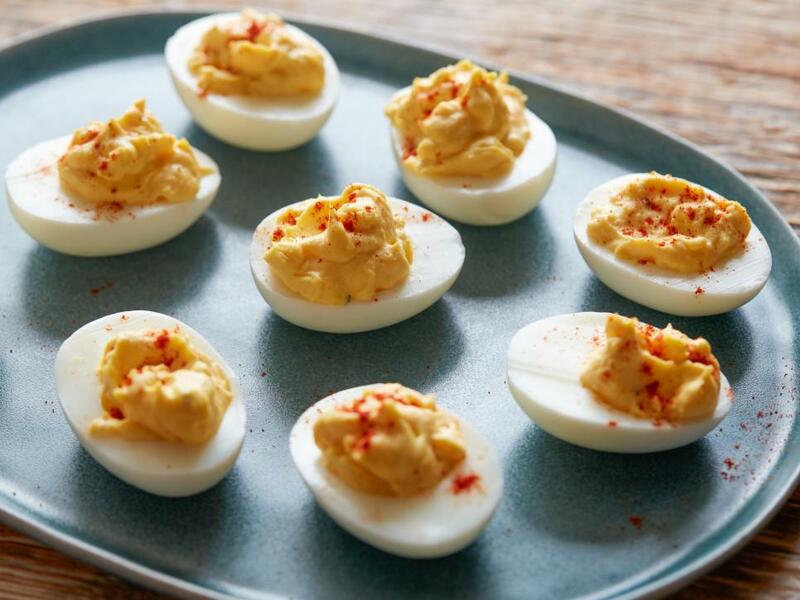 You are going to be making larger batches which will require increasing the quantities of your ingredients. But changing the size of your batches can affect the flavor. You should allow for some initial test batches once you have equipment in place. 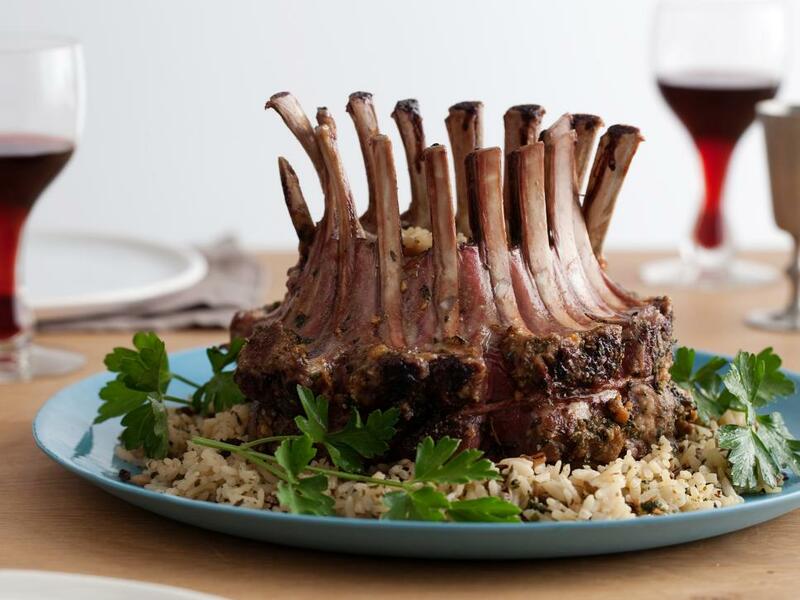 Then you can tweak it as needed to achieve the flavor profile you are expecting. And while I mentioned water above, another aspect to take into account is the quality of water you are receiving. The pipes or well that you are receiving the water from now will be different. Do you have the water processing equipment in place to treat the water to achieve the formula you need for the style you are brewing? 4. 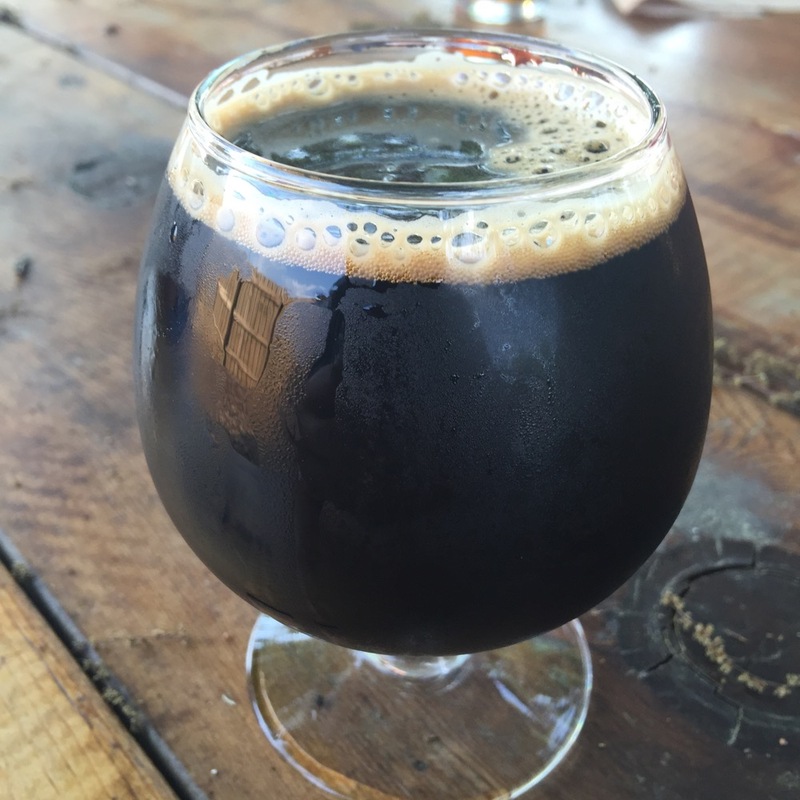 Market – So you can brew good beer. So what? So can a lot of other people who may already be established in your area. What will differentiate your brand from theirs? Is the area you want to establish your business in already saturated? Are you going to specialize in certain types of beers or have flagships ales with specialty beers based on the season? Will you have guest taps for selling other breweries offerings? If you establish a pub or tasting room, will you serve food as well? What will the menu be? Who will cook it? What will be your hours of operation? All of this needs to be thought of and prepared for before you begin building/renovating. The breweries I mentioned previously that failed, didn’t take these and/or other factors into account when they tried to start. They leapt full force into making the beer because that is the part of the business they thought they knew, and forgot that at the end of the day, it still has to be a business that can sustain itself. And like a lot of American businesses that don’t have a good business strategy they failed to adapt. A good business strategy will begin with knowing how much operating capital you will have. Then as your business becomes more established and you have your business practices in place, you need to evaluate how those will work if you expand. Will they work on a larger scale? Or do you need to change them so that you can adapt to growth? Some breweries, even more now than before, start as simple microbreweries or brew pubs with no intentions of expanding. They are targeting a specific market or a niche in a market. Doing this will eliminate headaches that a larger brewery will encounter. They don’t have to deal with the stranglehold that the Big Beer makers have over the distribution system. They also are only worried about local competition, not Regional or National competitors. The onslaught of new brewery openings has slowed over the last couple of years. While there is still growth, it has slowed to less than 5%, whereas only a few years ago the growth rate was into the 70 percentile range. And the number of production breweries has slowed even more. A larger number of the newer openings are microbreweries or brew pubs. Let’s talk about glasses …. No… not those glasses… These glasses! Half the battle of really getting the flavor out of your beer, no matter the style or brand, is serving it in the proper glass. Using a glass specifically designed for the liquid you are consuming has been a standard for wines, liquors and cocktails for almost a century. 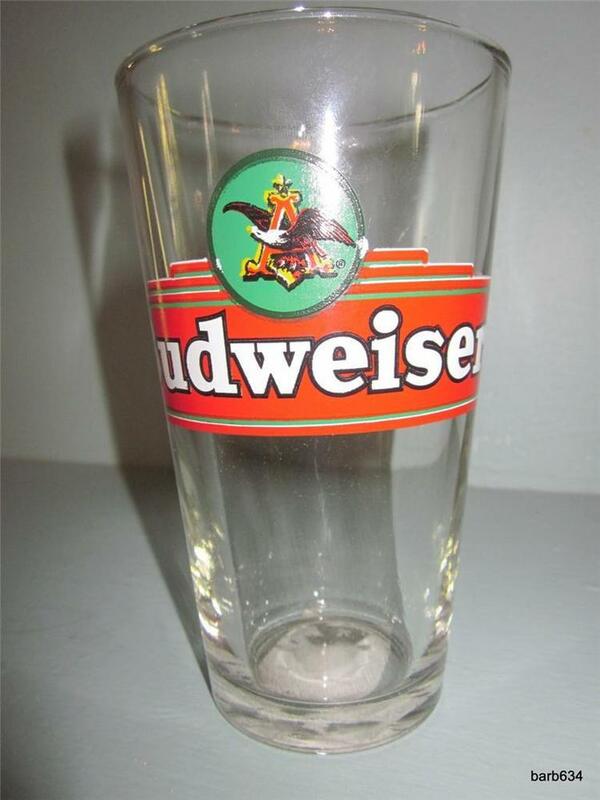 It took the craft beer revolution for Americans to be awakened to the idea of proper glassware for beer. The reason for this, of course, is the inferior flavor of the current (and if I may add, waning) reigning American Light Lagers. That and the co-opting of American bars by the U.S. Beer Distributors. 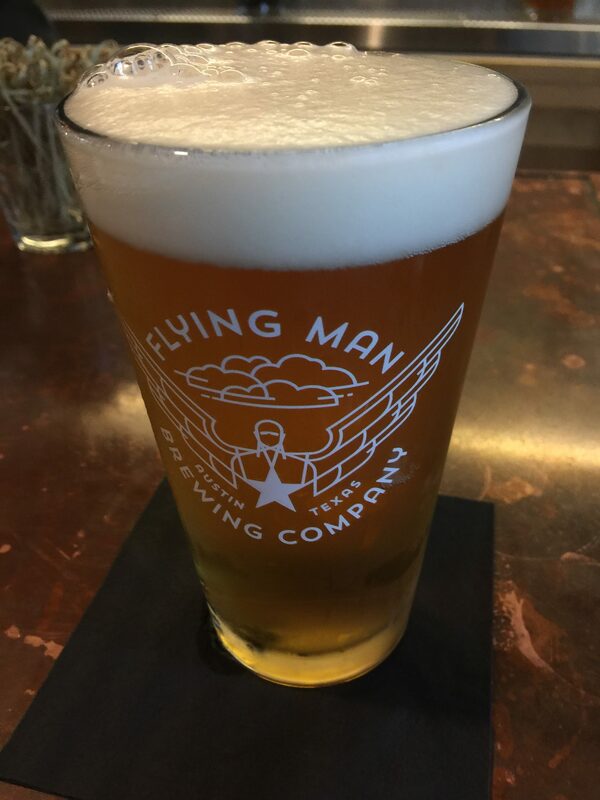 For many years now, the Big Beer brewers have been pushing the beer logo -emblazoned pint glasses on to bars so that they can get their names out in front of the customers. The problem is that the glass they decided to use is, of course, the least expensive to produce. But it’s not even a proper beer glass. 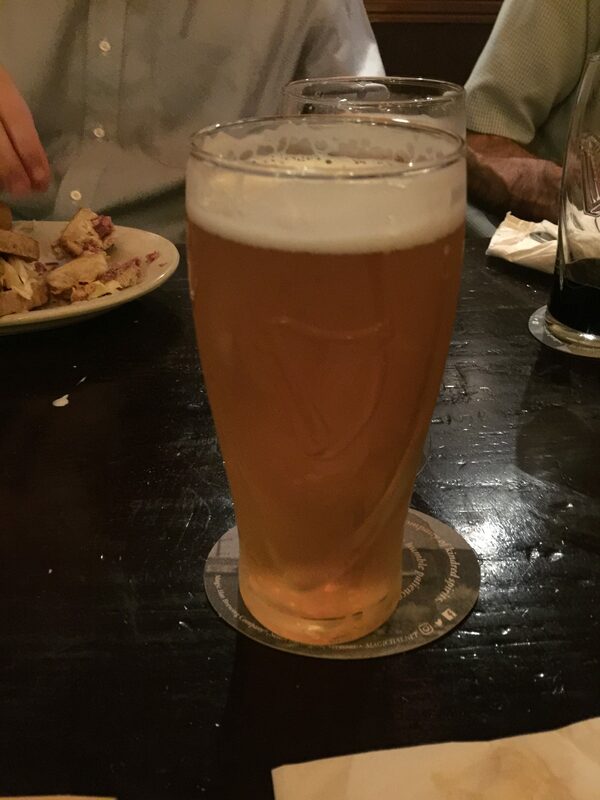 The pint glass (in America often called the “Shaker” and in the UK the “Nonic”) does nothing for any of the beers styles served in it. It often causes the beer to lose flavor and carbonation sooner than it should. The Shaker was originally a bar glass used for mixing cocktails (thus the name “Shaker”) and was repurposed for serving beers by many bars for the cost efficiency as well as the ability it has for easy stacking. 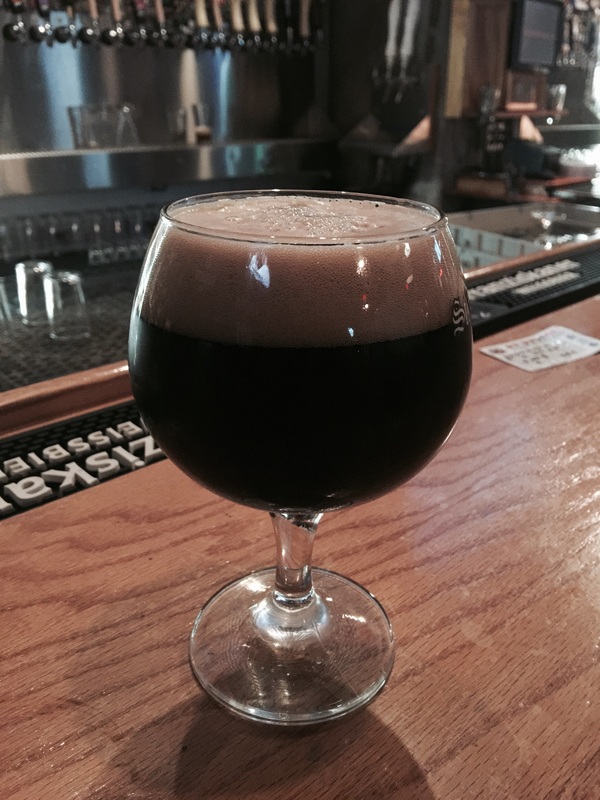 In the ‘70s and prior, most bars would serve beer in mugs, chalices or pilsner style glasses. 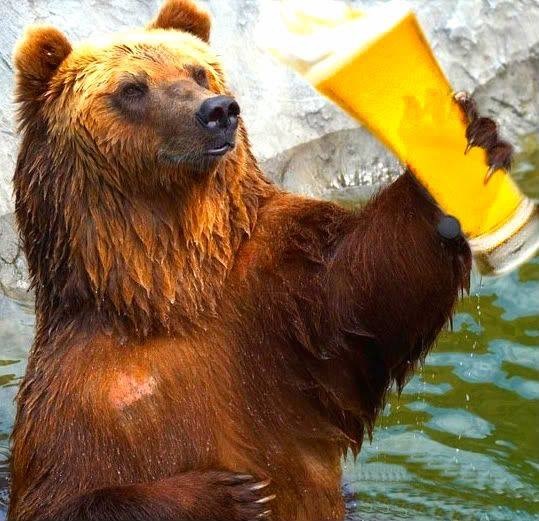 But thanks to the commercialism of Big Beer and their associated Distributors, we now have an entire generation that is ignorant of proper beer serving techniques. So, let us review the Do’s and Don’ts, the rules of proper beer serving and the correct glassware for your favorite craft beers. We’ll start with the Don’ts! Don’t drink it from the can or bottle whenever possible! i. If you don’t pour the beer you don’t create the head of the beer and therefore are missing out on the aromas that enhance a good beer. ii. If you don’t pour the beer the carbonation is still trapped in the liquid. This means you are swallowing carbon dioxide, which can lead to indigestion and affect the aftertaste of the beer. Don’t pour beer into a pitcher!! No. No! NO chilled glasses!! Ever!! i. Chilling any liquid changes the flavor. More bitter and unpleasant notes and flavors become clearer as the liquid begins to warm. This is true of wines, liquors and beers. That is why brandy drinkers will swirl the brandy around in their snifter while letting the bowl rest in their palm. The heat from the hand warms the liquid releasing additional flavors and scents they can enjoy. If you prefer the beer to be just above freezing in order to drink it then you are likely masking unpleasant ingredients. 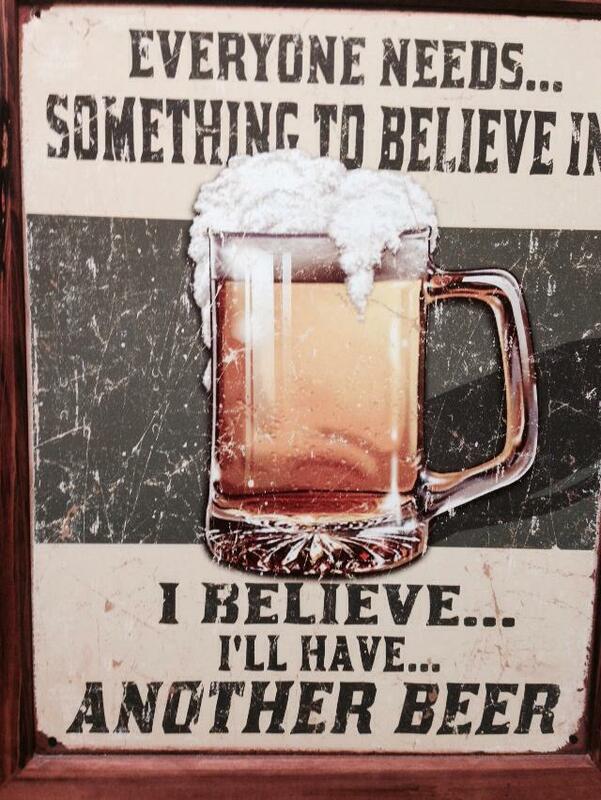 Wouldn’t it be better just to start with a better beer? ii. Dipping a glass in water then sticking it in the freezer means you are coating the glass with water. When you pour the beer into the glass you are actually watering it down. iii. Chilling the beer not hampers the flavor but the scents of the beer, which in turn affects the overall tasting experience. iv. It only delays the inevitable. 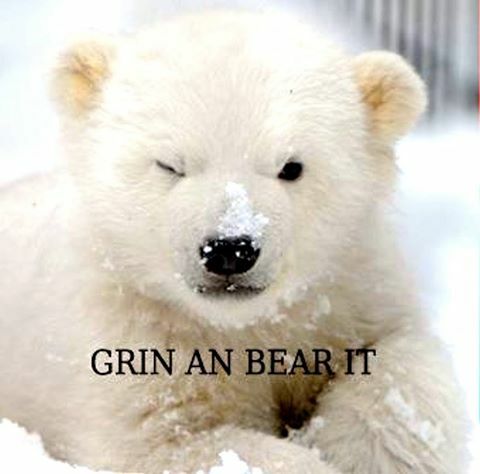 And if you have to have your beer ice cold then you need to drink it fast in order to avoid drinking it warm. v. It’s a trick! Bars and breweries that practice this do so to hide the real flavor of bad beer. 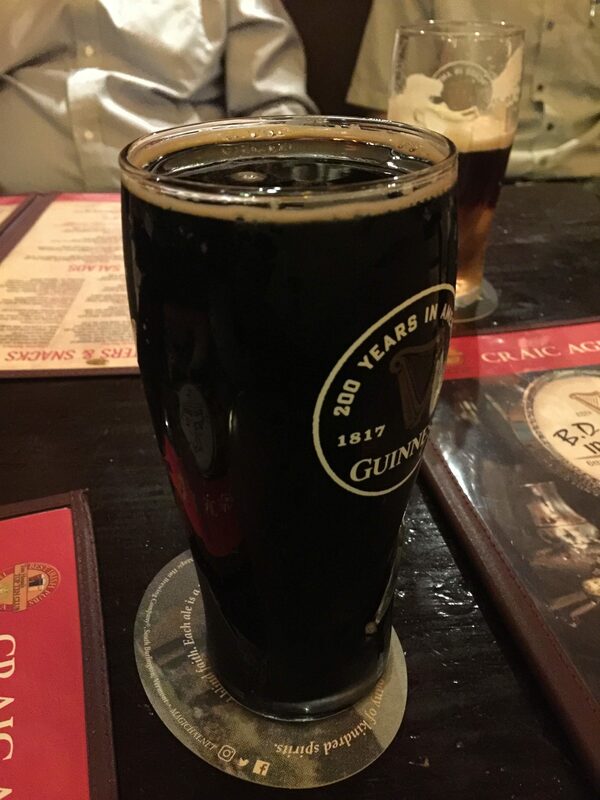 b) If you read my last article then you read that while in Austin at the hotel bar I asked for a non-chilled glass so I could properly drink a breakfast stout. The look of shock on the bartender’s face was such that you would have thought I asked her to remove her clothes! Another victim of the Big Beer and Beer Distribution campaign against proper beer serving! That’s enough for the “Don’ts”… Let’s talk about some “Do’s”! Tucker likes good craft beer too. 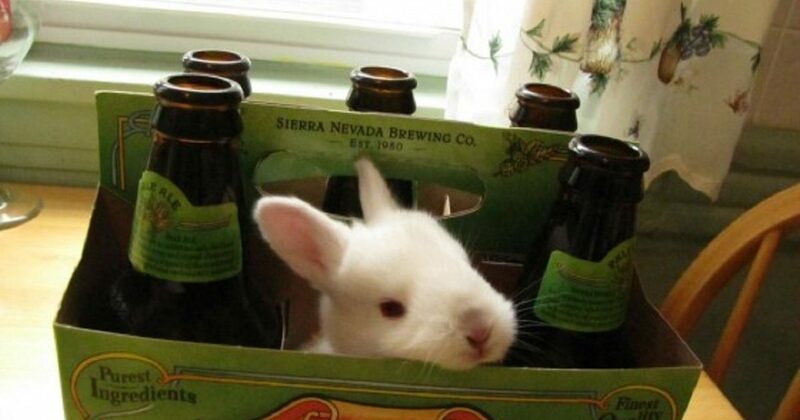 Don’t worry I know hops are bad for dogs. This is a Hefeweizen and he only licked the empty glass. Make sure any glass you serve in has been properly cleaned. And when I say clean I also mean properly rinsed. Soap on the glass can be just as detrimental, maybe more so than any previous liquid contaminants. Unfortunately, sometimes the only way to tell how clean a glass may be is to look at how the suds slide down the glass. If you have a fairly even recline in the way they slide down the glass wall then the glass is clean. But if you see suds clinging more so to one area than another, it is likely there is at the least some residue, whether it is soap or something else. When pouring a beer, whether out of a can, bottle or keg, tilt the glass slightly so the beer pours down the side of the glass until the glass is about half full. Then straighten the glass and let the beer pour into the center. This will begin releasing some carbonation and help to form a good foamy head without it being too big. And lastly, please select the glass that best fits the beer style you are serving. 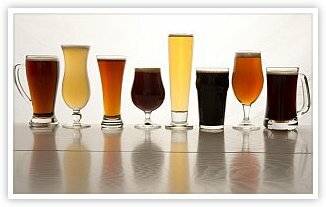 Below is a list of the some of those glass types and the beer styles that are best served in them. We have already discussed and discredited the pint glass and though it is the most utilized glass style we will not include that in the discussion. b. Goblet or Chalice – This style allows for head retention and allows for big sips. It is intended for beers with a higher ABV. d. Stein – Originally made of glass, clay or wood. 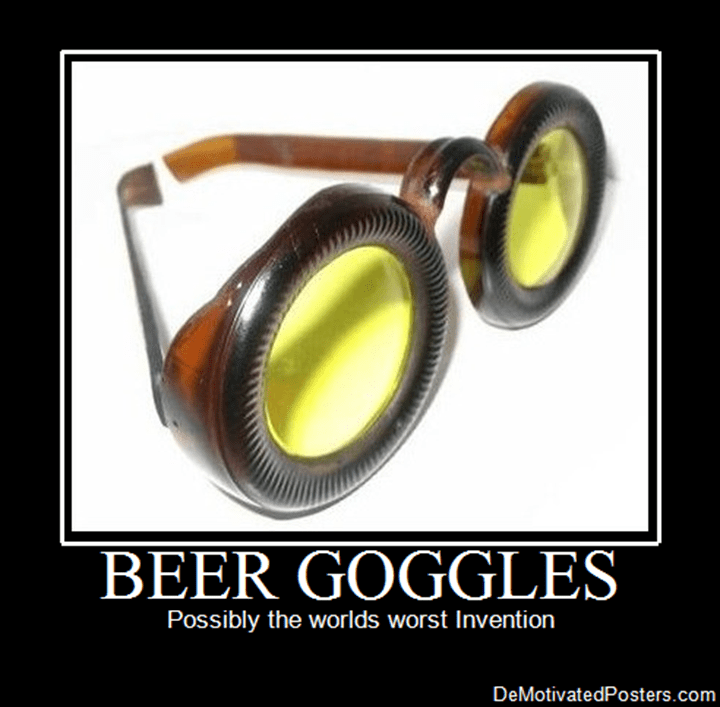 During the middle ages they began to feature a lid to help keep pests out of the beer. e. Pilsner Glass – Intended for use with it’s namesake this glass feature a conical shape with no curvature to the sides. It is intended to showcase the color of the beer and help to retain the head. f. Snifter – This wide bowl shaped glass allows aromatics and volatiles to be released and like it’s cousin used for brandy will allow the heat from the users hand to warm the beer. This is primarily intended for beers with a higher ABV. • Most beers with over 7% abv. g. Stange – German meaning “Rod”this cylindrical glass shape is meant for lower capacity and lighter beers. h. Tulip – Bowl shaped at the bottom with a mouth that flares out this glass is great for strong aromatic beers with a lot of hops. 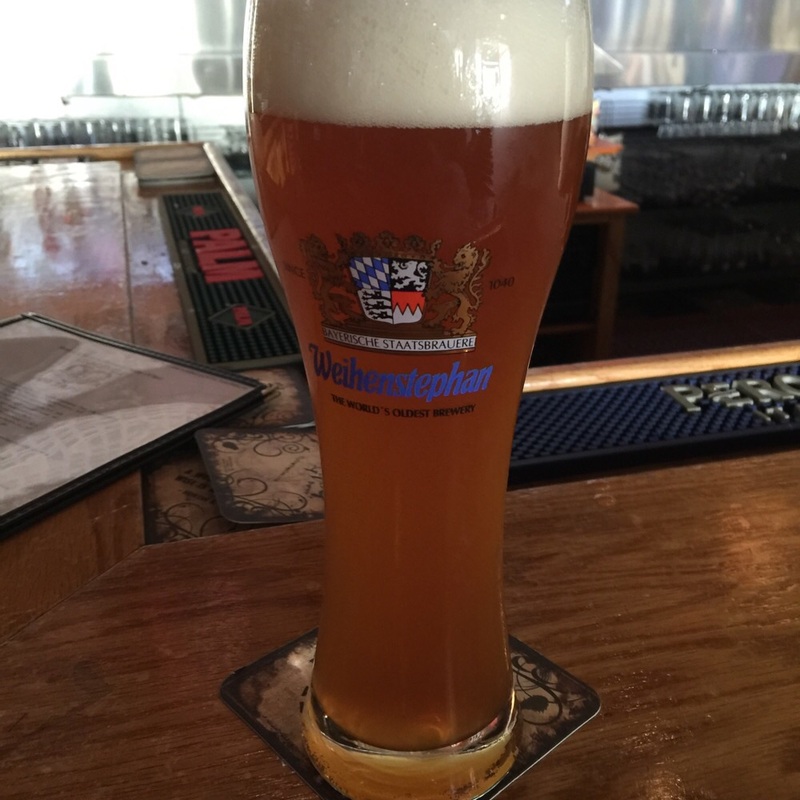 j. Weizen – sometimes confused as a pilsner glass this glass is actually much larger and has a curved shape to the upper glass that helps with head retention. Its a tapered glass with the narrow bottom that helps to trap yeast. It is intended strictly for wheat beer. 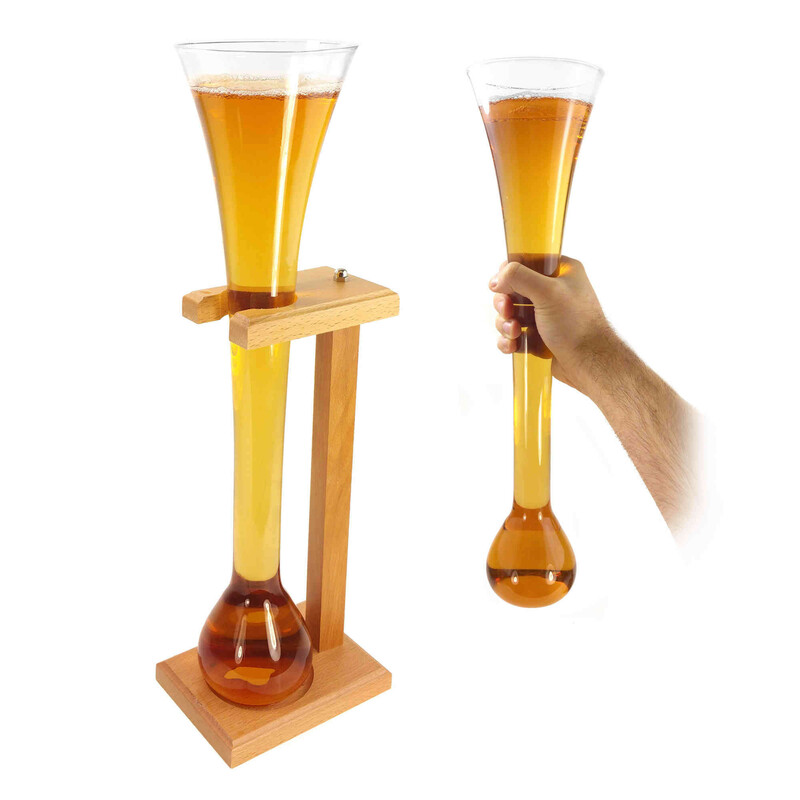 k. Over-sized Wine Glass – It is a wine glass that is used for serving stronger flavored and higher ABV beers. Boots – Called so for their familiar shape, this glass is more of a novelty because air can become trapped in the toe of the boot and when the air pocket releases it can cause a splash on the drinker. 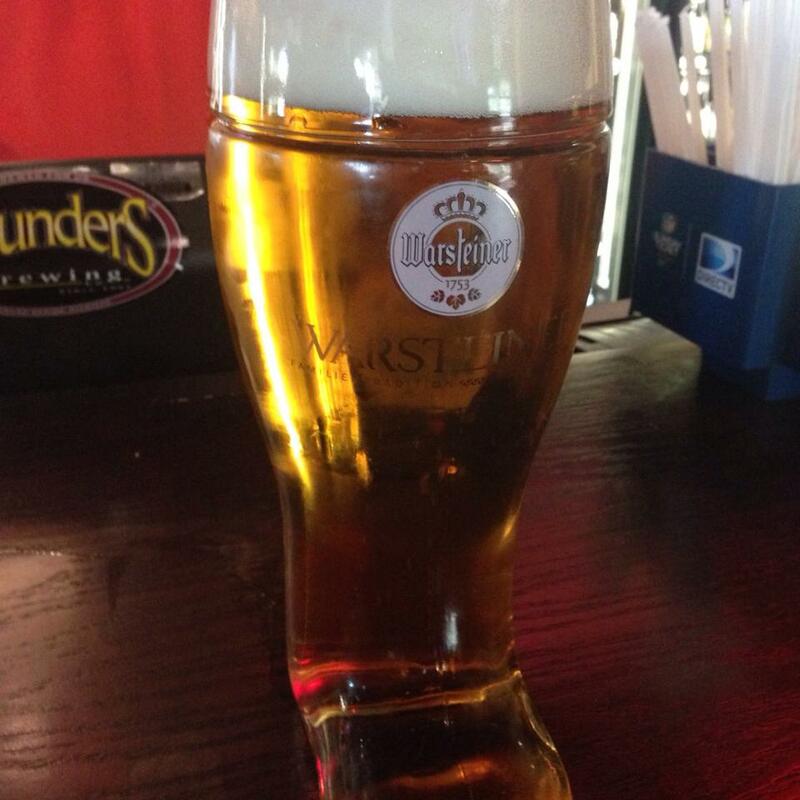 Thought to be of German origin and German style beers are typically served in it. No! Not those kind of glasses! 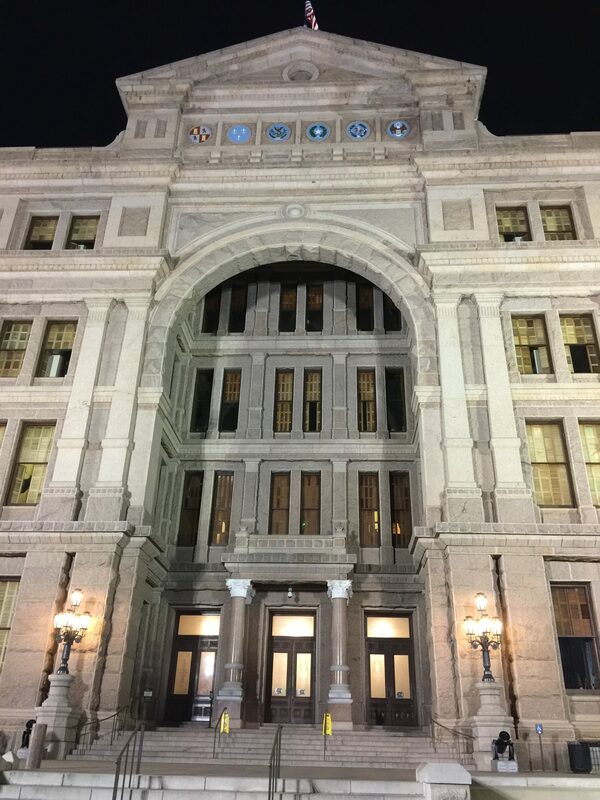 A Visit to Austin, TX and a Very Hopp-y Easter! It’s been a few months since my last post and to be honest I’ve been so busy at work that taking the time write an epistle was not a priority. Ironically, it took a work-related event in the form of a conference to cause me to stop… take a breath… and realize how much time has passed since I had flexed my blogging muscles. I will not go into conference details as, unless you using SAP as your ERP system, then you are not likely to find any interest in that aspect of the story. But I will highlight some of my exposure to Austin’s food and craft beer cultures. 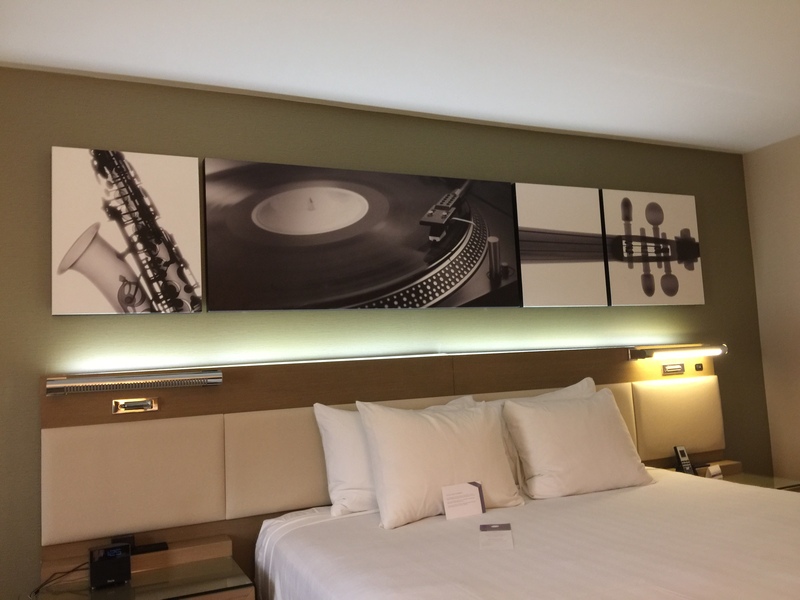 The décor in my hotel room in the Hyatt Regency speaks of Austin’s musical background in Texas Blues. My arrival on Monday the 26th included an afternoon session, after which I met up with colleagues from other companies as well as a my coworkers who also attended including a former colleague who was working in a related but different industry and was there for the conference. The meet-n-greet included free alcoholic beverages so I took the opportunity to begin sampling some of Austin’s craft beer. 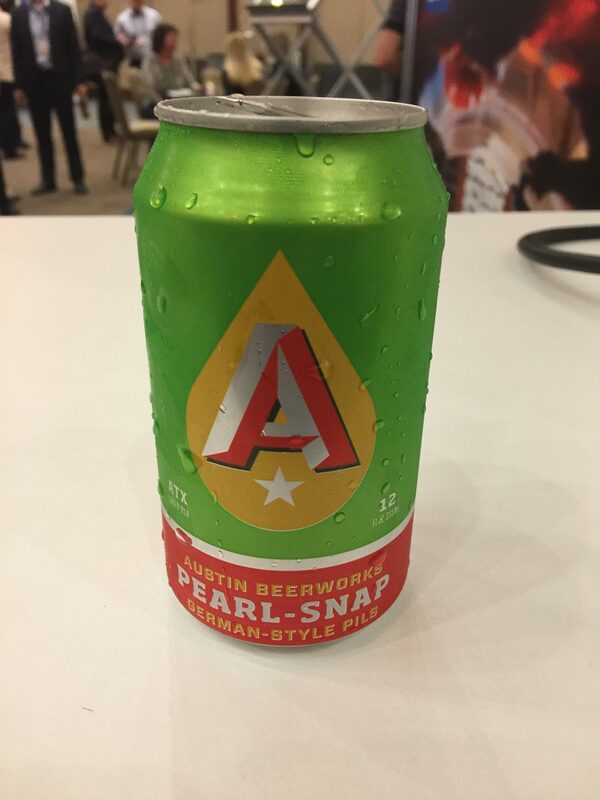 My intro was a Pilsner from Austin Beerworks. It had a good Pils flavor though it was slightly stronger in the hops arena. My only complaint was that they did not include a glass to serve it in. 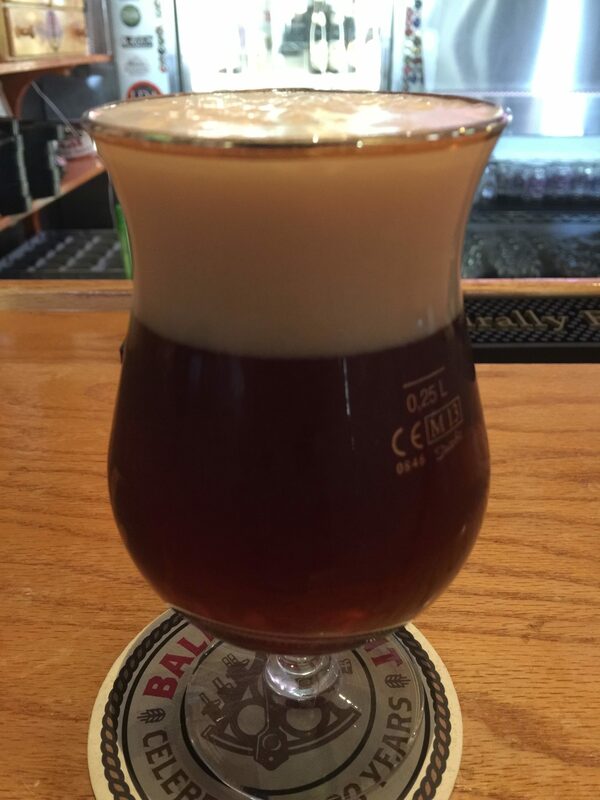 I would like to have seen how the beer clung to a clean glass and what kind of head it produced. After the meet-n-greet my colleagues and I took a stroll across the Congress Avenue Bridge and headed north toward the Capitol, until we got to 6th Street, then we turned right and went another block and entered BD Riley’s Pub just on the left. 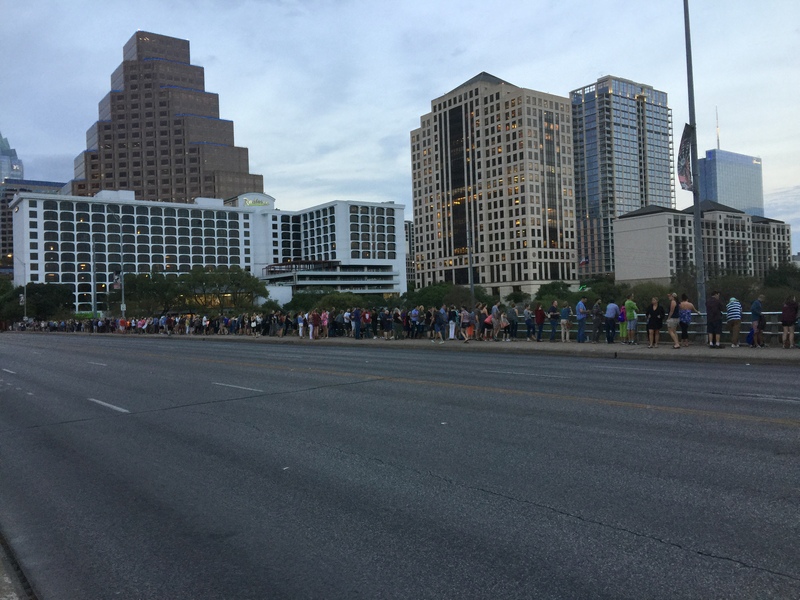 Observers waiting for the Bats on Congress Bridge. Heading north on Congress Avenue you can see the Capitol building in the distance. BD Riley’s is an Irish Pub to be clear but it’s an Irish Pub in Texas. So the Blues music cultural is definitely alive and well there (see link below). 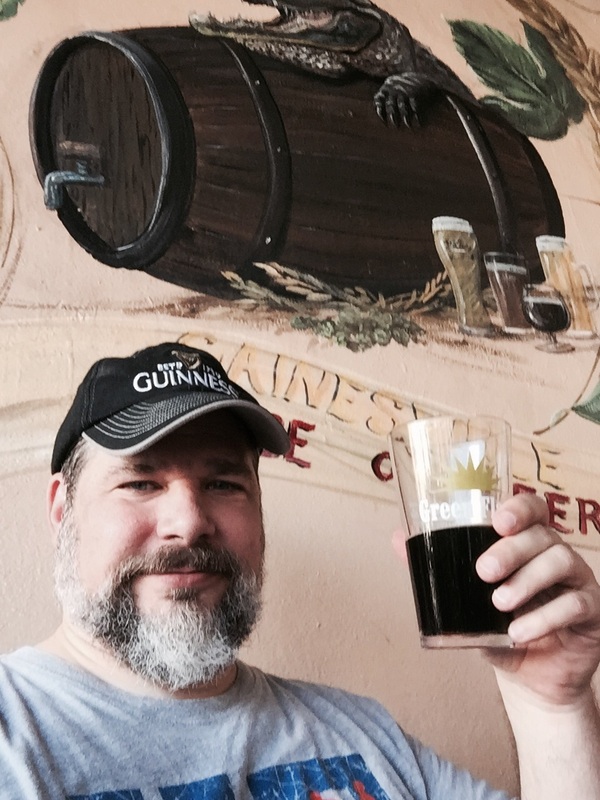 While there I started with a really good Pecan Porter from (512) Brewing Company. It has a really great flavor and look to it. And it went well with the Appetizer Sampler platter we ordered. The wings had good heat the fried dill pickle slices were tasty and the chicken planks weren’t bad. I didn’t have any stuffed potato skins but I was told there were delicious. For my main course I ordered the Chicken Newton. 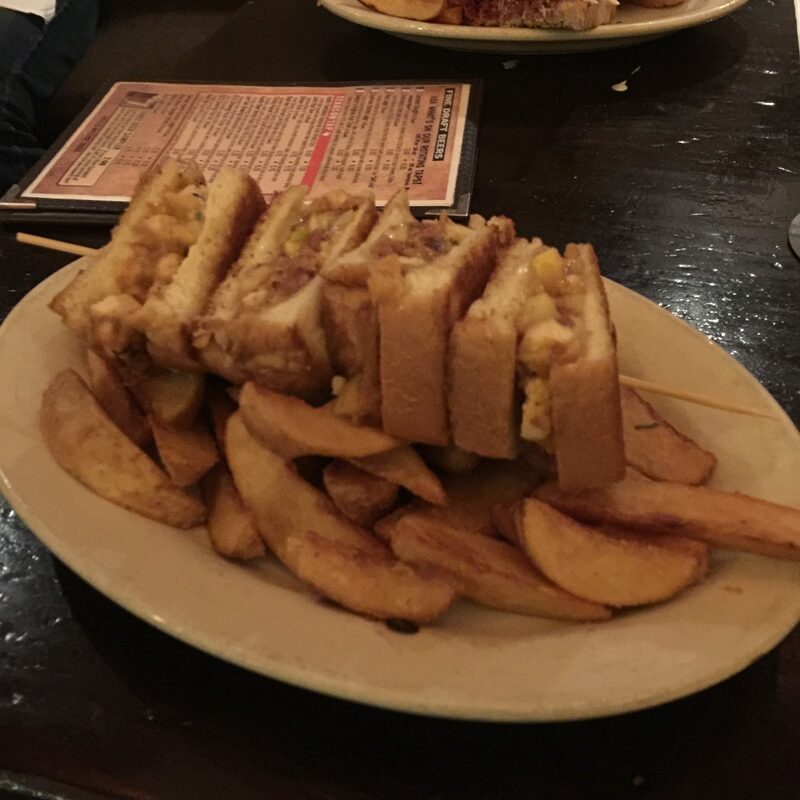 Which contains pulled chicken breast, crisp bacon and tangy green apples chopped and topped with a four-cheese blend then skewered on Texas Toast quarters. I paired that with an Axis IPA from Real Ale Brewing. Both were very good and satisfying. We headed back to our hotel after dinner and awaited the next day’s sessions of conference presentations. After all of the speaking and mingling of the day, we met up with a mix of other utility companies at a social dinner sponsored by one of the Vendors at the conference. It was a good mix of discussions about our day to day activities as well as comparisons of how each company handles their own tasks. We also ventured off into other avenues of interest which included travel, foods and craft beers (for some of us). It was good to meet people from other areas who shared my interest in Craft. The dinner was held at Zax Restaurant & Bar, a short walking distance from the Hyatt Regency. They had us segmented away in a corner of the restaurant and rightfully so as there were about 30 or more of us. I walked back toward the bar to view the display of beer taps and see what the fare was. I was surprised to find that most of the taps were local brands, and only a few were more well known (Lone Star, Shiner). I started out with a Kolsch named All Call from Lakewood Brewing. Very nice Kolsch flavor and it re-enforced the reputation that a lot of breweries in Texas are specializing in Lagers, Pilsners and other German based brews. As the evening went on and discussions carried forward we began placing our orders for dinner. When I did I also put in an order for what they called their “Austin Flight” which was an all Austin based sampling of beers. This included a Pilsner, an IPA, a Vienna Lager and an Amber Ale. I wish I could tell you the breweries but I wasn’t fast enough to write them down, much less hear them correctly with the background chatter surrounding me. I can say they were all good examples of each style and very tasty. 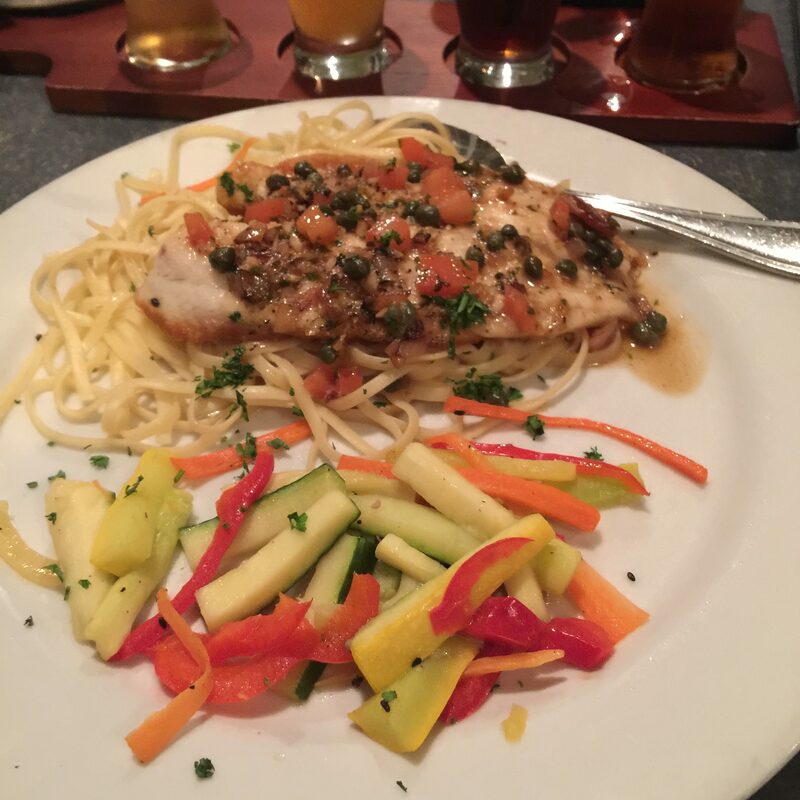 They also complemented the dinner of Tilapia served with capers on linguine and mixed veggies. 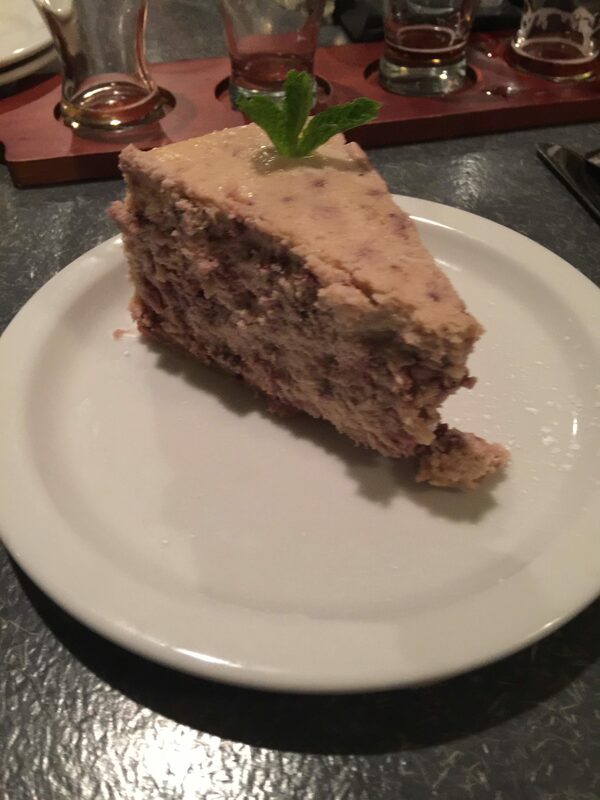 And I have to give a mention to the delicious Blackberry Ginger Cheesecake that was made on site. A very tasty dessert. That evening drew to a close and we went into the last day of the conference with all of the associated sessions. By 5 PM the conference was ended and many folks had gone on their way to their respective destinations. 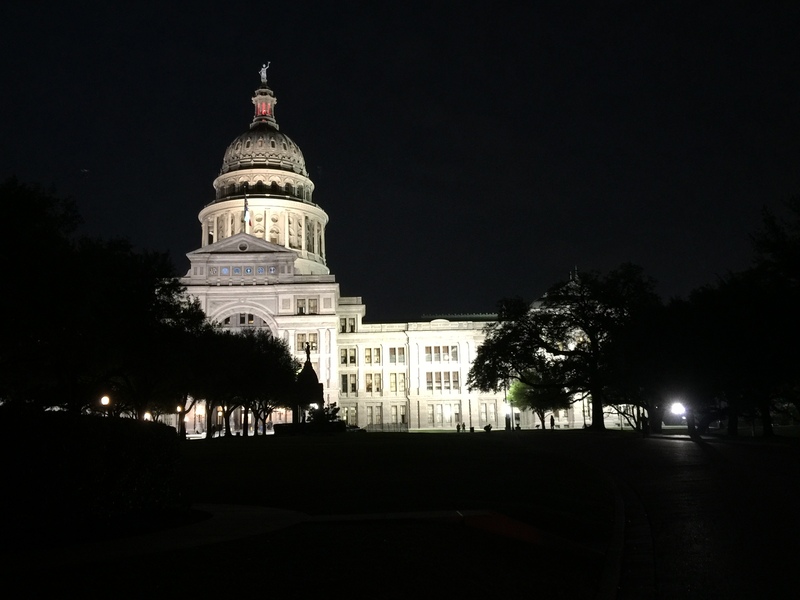 My colleagues and I weren’t returning until the next day, so we spent Wednesday evening with one last journey into the Austin air. 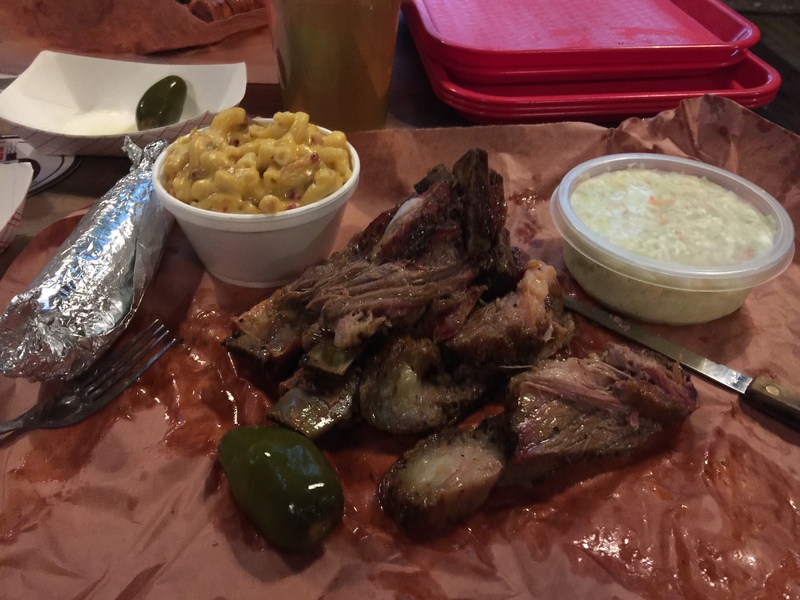 We decided to follow a recommendation (from several sources) for local BBQ, Cooper’s Old Time Pit Bar-B-Que, located on Congress Avenue between 2nd and 3rd Streets. Being a short walking distance from the hotel didn’t hurt. We arrived just before the customary line out the door started. In fact, it started forming behind us as there was a small line to get in to put your order inside. 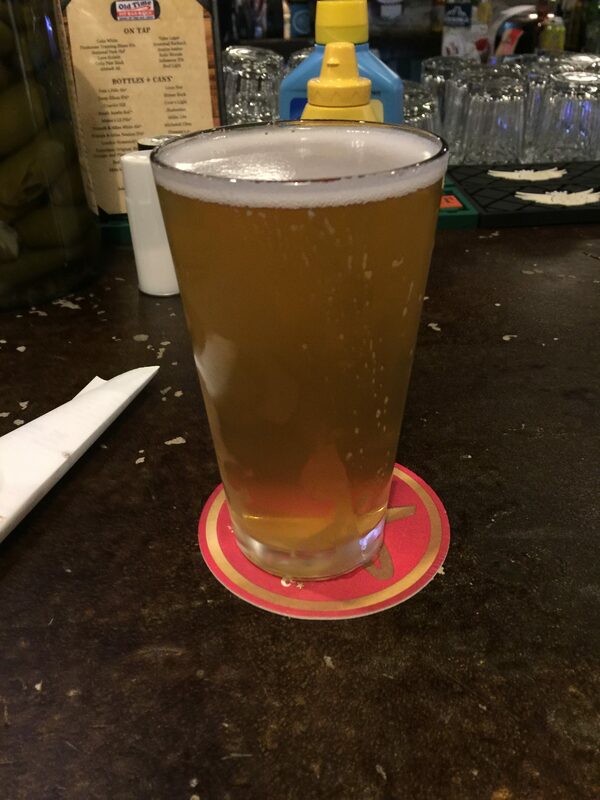 While waiting on the inside line I ordered another local beer, National Park Hefeweizen from Big Bend Brewing. This was a very tasty Hefe and paired well with the BBQ Pork Ribs and Brisket I ordered for my meal. It also went well with the cole slaw, grilled corn on the cob, and the jalapeno-bacon-mac & cheese that I had for the sides. That was some of the best BBQ I have had at a restaurant ever! I highly recommend this place if you find yourself in Austin. Not only is the BBQ very good but the beer selection is great as well. There are two levels of seating as well as outdoor seating and they were filling up by the time we left. We decided to take a stroll and found ourselves heading north for the Capitol building. 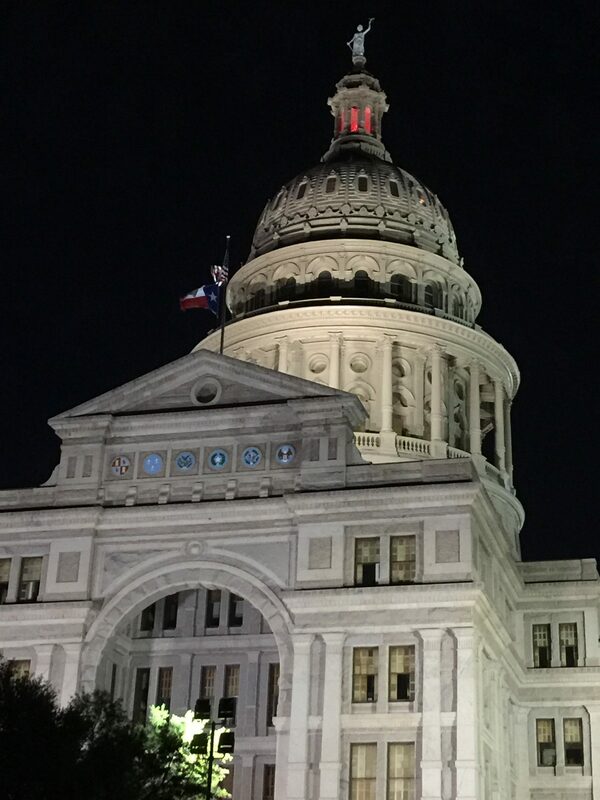 Unknown to me until informed by the Supershuttle driver who brought me from the Airport, the Capitol in Austin is the largest Capitol in the US. And after having seen it in person I believe her (see pics below). 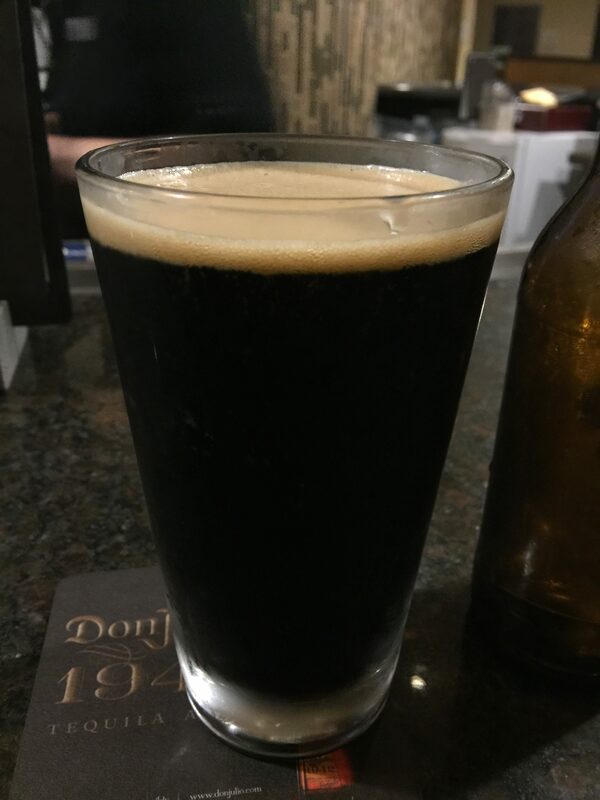 After walking to the Capitol and making our way back to the hotel, I decided one final draft was in order, so I went to the hotel bar and ordered a perfect dessert beer to top off the evening, the Convict Hill Oatmeal Stout from Independence Brewing. In the morning, I arose and showered then began to pack and decided to get breakfast at the hotel. 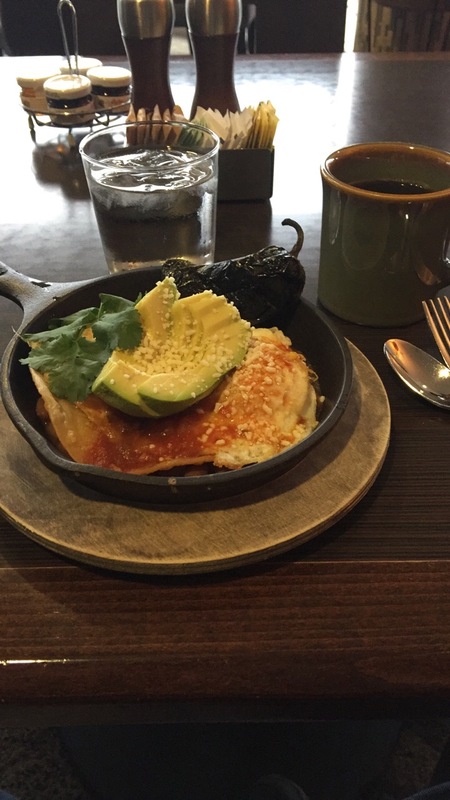 The view was cloudy but pretty and the breakfast was a tex/mex fave of mine, Huevos Rancheros. The layer of beans covered with sausage and a couple over easy eggs, topped with avocado and a grilled jalapeno was a perfect “I’m going to be traveling all day and don’t know when I will eat.” type of breakfast. A good final meal to say goodbye to Texas with. My only complaint about the trip would be how beer is served in Austin, and this may be true throughout Texas. I don’t like drinking from a can. No matter how good the packaging technology may be, psychologically I still taste metal. And I don’t like that they serve their beers in frosted glasses. In fact, when I asked for a non-frosted glass the bar person looked at me like I was crazy. They obviously haven’t been taught in Texas that frosting the beer glass masks the flavor of the beer. 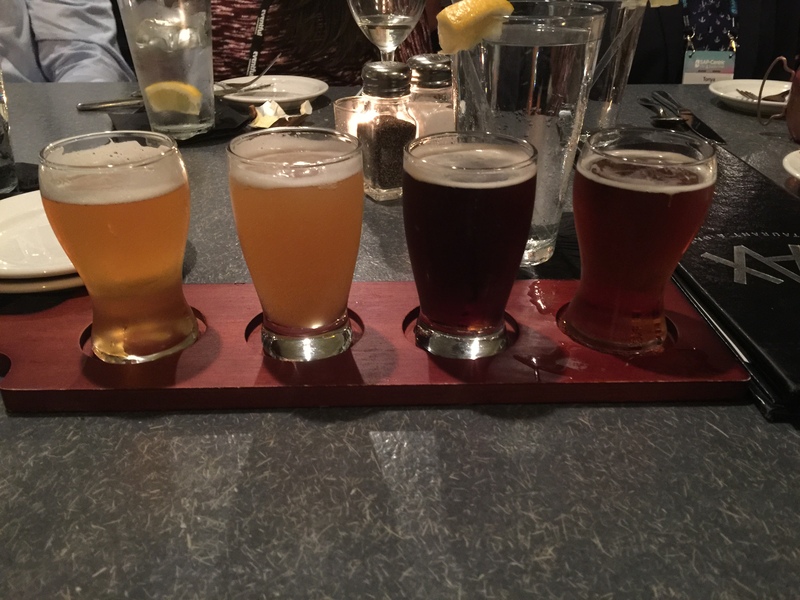 And while the beers I had tasted good, I really didn’t get their true flavor because they were all masked. That is a bit disappointing in a town that pride’s itself on craft beer. I would like to add that I have been to Texas many times in the past, (San Antonio, Dallas, Houston and parts in between) and none of those visits has been as rewarding as this one. 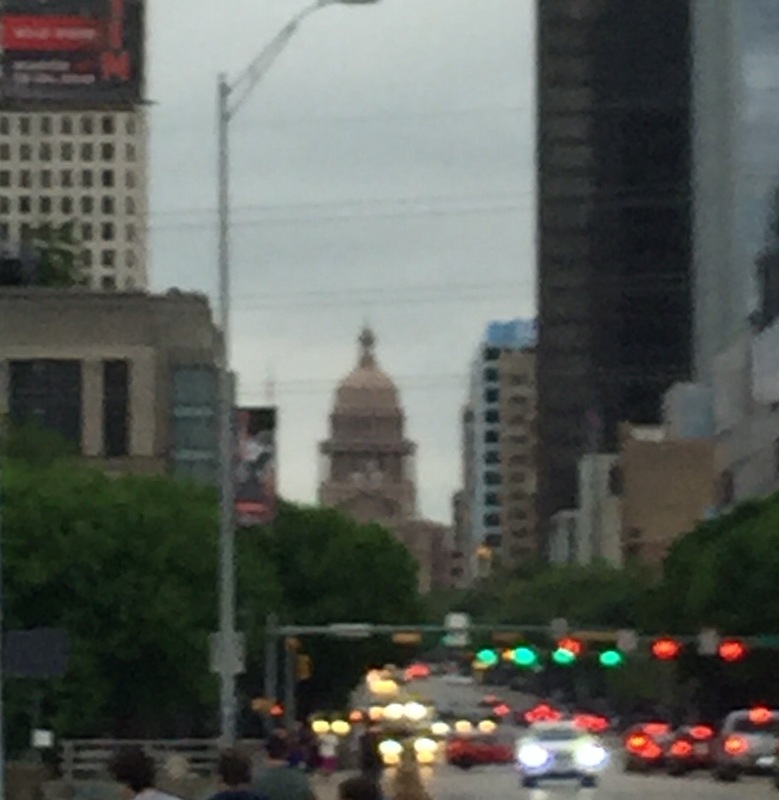 I would readily take a trip to Austin again, whether on business or as a vacation destination. I cannot say that of the other parts of Texas I have been to. A no-show of a co-pilot delayed my connecting flight in Atlanta by about a hour and half so I didn’t get back into Gainesville until after 8 PM that Thursday. 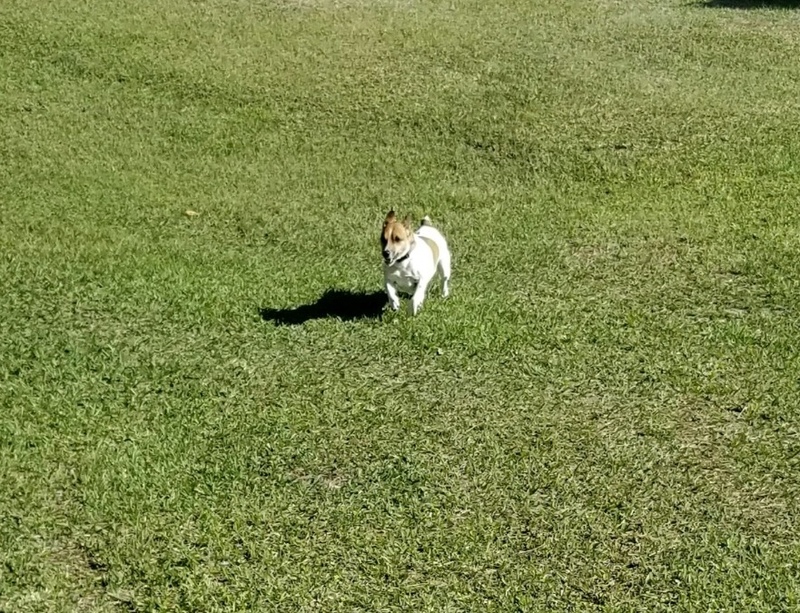 So I was unable to pick-up Tucker from the Doctor’s house until the next day. Luckily for me, the Doctor was able to keep Tucker entertained while I was away. 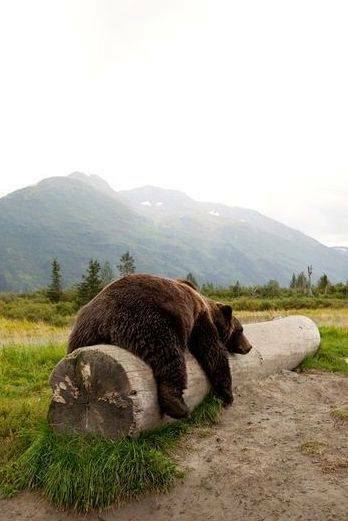 So much so that he slept well while he was there. So now I am home and spending my Easter with my little beer hound. 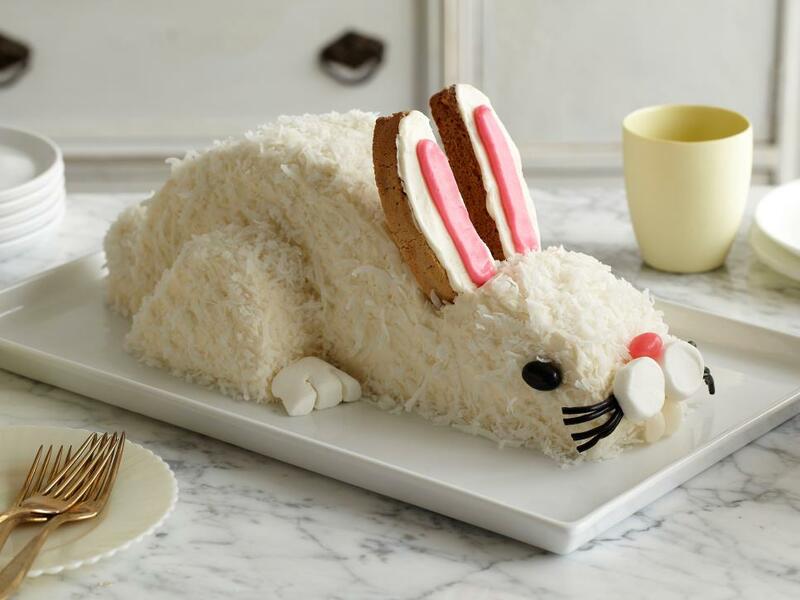 I hope all of you are getting to spend Easter with your loved ones and enjoying the day. 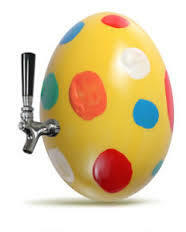 Maybe you’re hunting for eggs or for a new tradition that seems to catching on beers. 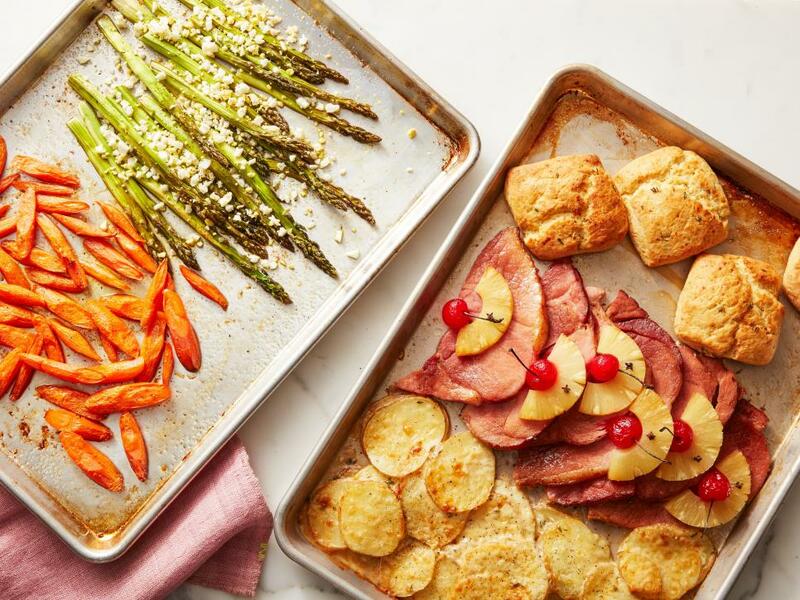 Most of all I hope you’re enjoying the holiday meals that have been prepared, both the traditional and non-traditional. However you are spending the day, whether based in faith, or in spending time with family and/or friends, or both I hope you enjoy the colors and flavors of the day and match them up well with your favorite ale! 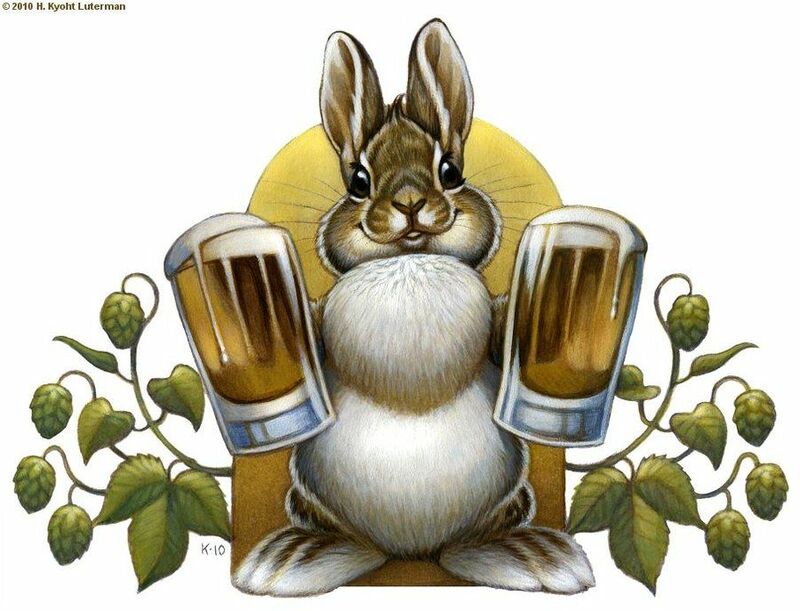 Posted on April 1, 2018 Categories Art of Beer, Cooking w Beer/ Food Paring, Good Food, Happy Hour, Tap roomsTags #craftbeer, #foodie, @CraftBeerATXLeave a comment on A Visit to Austin, TX and a Very Hopp-y Easter! 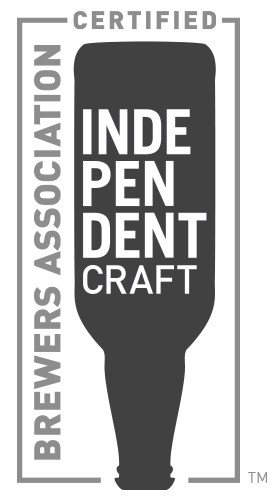 Welcome to the unofficial State of the Union of Craft Beer (or Independent Beer or Micro Beer or whatever someone decides to name this movement next)! I call it unofficial because I am certainly not the President of this beer culture. I’m not even a Congressman or Senator. I am simply an amateur brewer, blogger and beer aficionado. 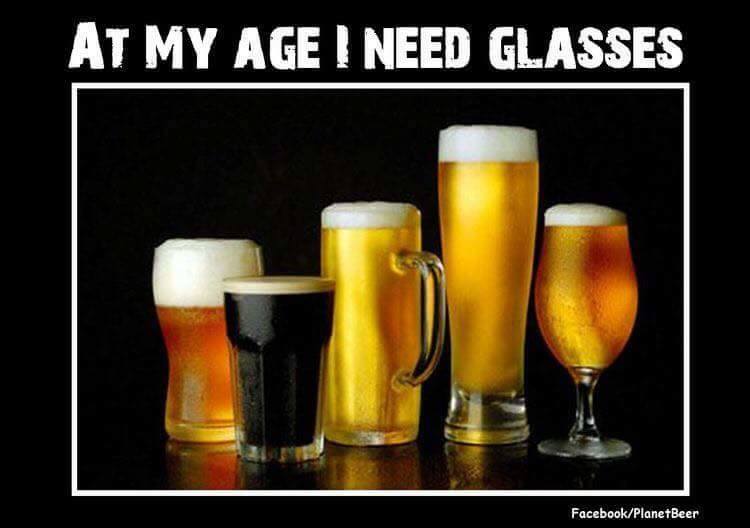 But I love great tasting beer and have done so for 36 years now. Spending 36 years doing anything gives you a little bit of license when it comes to speaking about the subject. So, I am going to give you my observations about this last year and a little bit of what I see happening this coming year. Again, these are my opinions, or better yet, my conclusions as I will list some facts to back them up. 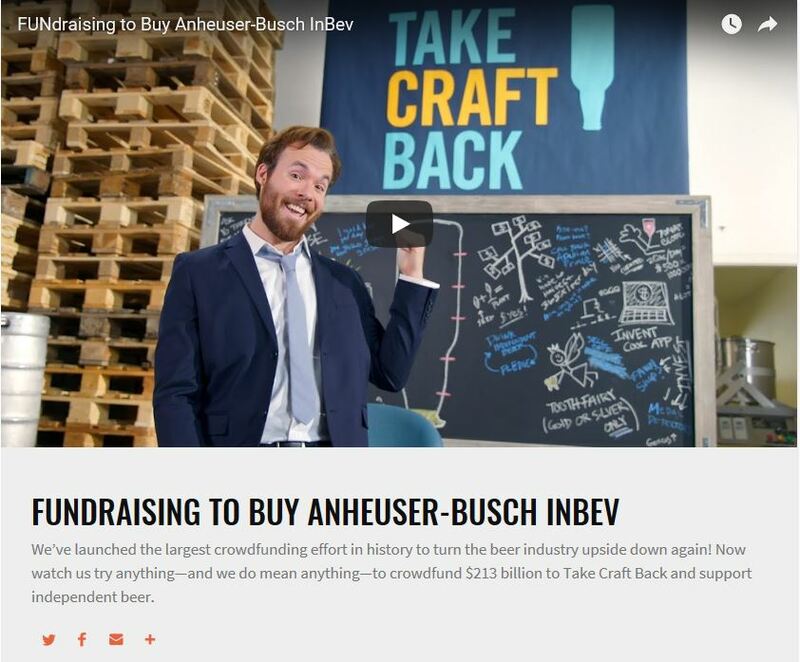 As was predicted last year, the Macro Beer companies (ABInBev, Molson-Coors, Heineken and Constellation Brands) continued their campaign of acquisitioning craft breweries instead of actually developing good beer. 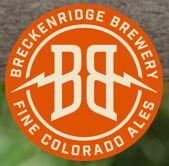 ABInBev placed both Wicked Weed from Asheville, NC, and Breckinridge Brewery of Breckinridge, CO, under their umbrella to join Goose Island, Land Shark and Leffe as well as 13 others that make up their High End Division. 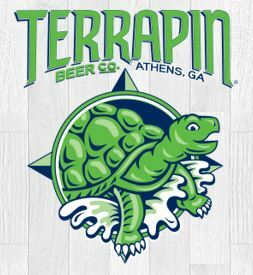 Molson-Coors acquired Terrapin Brewing of Athens, GA, because they didn’t have the ability to match Terrapin’s skills with their 97 other brands. 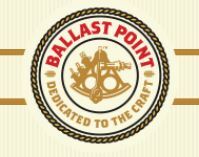 Constellation Brands, while not a big beer player and specializing more in wine and spirits, decided they needed to acquire California based Ballast Point Brewing to go along with their smaller stable of 9 brands. 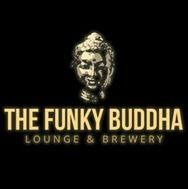 Then later in the year, they also acquired Funky Buddha Brewing of Boca Raton, FL. And Heineken International, with its stable of 119 brands had to add one more so they went after and acquired Lagunitas Brewing, also California based. 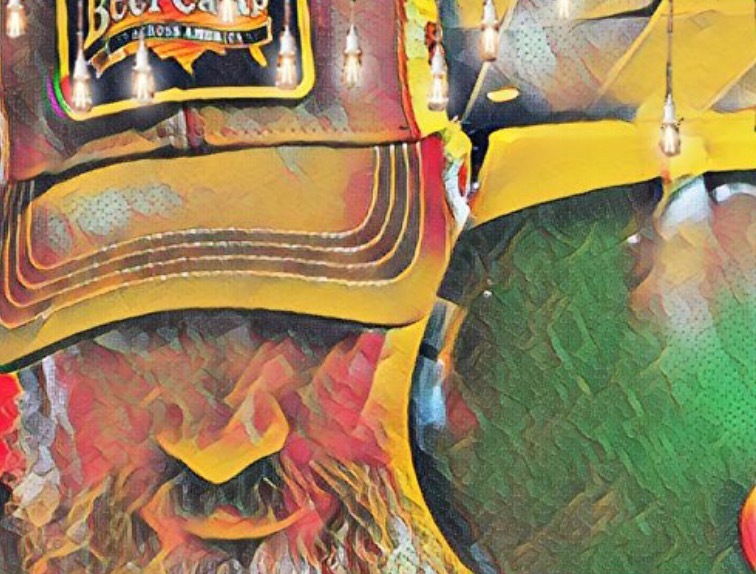 All of these Craft Brewer’s were excellent examples of companies who excelled at what they were doing but in order to do more they needed investors. Which is where Big Beer came in and gobbled up opportunities. Only time will tell if their accepting the offers from Macro Beer companies will be harmful or beneficial. In protest of Big Beer purchasing these companies I, along, I am sure, with many other Beer Snobs, have abstained from sampling or purchasing any of these former greats products. Another form of protest appeared in late October, in the form of the TakeCraftBack Campaign (see add below). This Don Quixote-ish attempt to buy out Macro Beer, while hinting at David versus Goliath proportions was actually done in jest. But I believe it did bring to light the practices that ABInBev and others use daily to keep craft beer from obtaining more of the market. 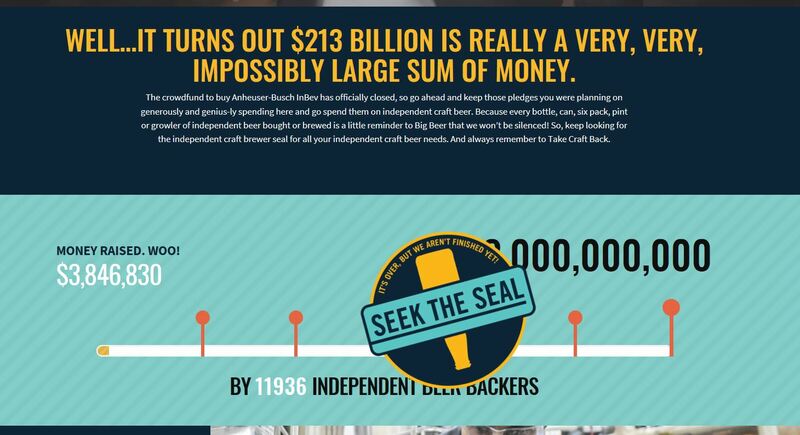 And while thousands of Craft Beer fans (including yours truly) pledged more the $3,000,000 to buy out Big Beer the goal of 213 Billion plus was laughably unobtainable. But everyone knew that going in. And at the tale end of the year some good news appeared in the form of legislation that would lighten the tax burden of many breweries making it easier for them to purchase each other’s beers and spread across the tap rooms of America. While this legislation benefits all commercial brewers big and small, Big Beer factors the taxes they were paying into their production costs. Smaller breweries may also do that, but smaller breweries are more likely to take that added available funding and experiment more with making different styles of beers. 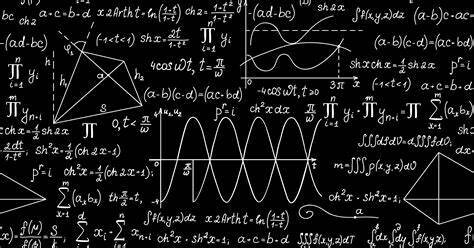 You’ve already seen that Macro Companies prefer to buy already perfected formulas than to develop new ones. 2017 saw a slowdown in new Brewery openings. In fact, many industry insiders are predicting that the trend going forward will be Micro Breweries or brew pubs. The brewery market is becoming over-filled with the number of brands and styles to choose from. So local pubs which may brew their own and bring guest taps will be where you see the growth. 2017 also saw more loss of market share by Big Beer to craft beer, wine and whiskeys. A trend which will probably continue this next year despite Big Beers efforts to buy up market share. Of the $107,000,000,000+ in revenue generated by the Beer Industry in America in 2016, about $23,000,000,000 of that was from Craft Beer, an increase of 10% from the previous years. Which brings us to now and the future, or at least 2018. I think you will see a reduction of buy-outs by Big Beer. The amount of dollars invested in craft Breweries does not equal the amount lost in market share, though that may vary from company to company. I do believe there will be an increase in Brew Pubs and Micro-breweries though even that will slow down compared to the last few years. I would not be surprised to see Big Beers change tactics and begin investing more in the retail end of the Beer industry, opening their own brew pubs in large populated cities where they can lock out their competitors. But that will only work if they can bring a good offering of cuisine to accompany their products. Otherwise it will be money down the drain. I would also not be surprised to see Big Beer begin head-hunting for brewing talent and begin expanding their capabilities for experimenting with new styles. It’s for sure that their current modus-operandi is not working. Whatever happens, I encourage everyone to continue to support their local breweries and try new beers as often as possible. I don’t know about the rest of you but the last few months for me have been extremely busy. We in Florida had a rather worrisome lady friend, named Irma, give us one helluva visit in September! She may not have been as dangerous as we thought she was going to be, but she was plenty dangerous enough for me. Her arrival in the wee early morning hours on September 11th, and her subsequent departure later in the day, left the utility company I work for enough to keep us busy for 8 straight days of 17 hour shifts. By the time it was over we were exhausted, but we had services back up to 100% of our customers in that time frame. A lot of other places in Florida weren’t as fortunate. This also put a little bit of a time constraint I had on prepping a new RV trailer I purchased the week before, Labor Day weekend. 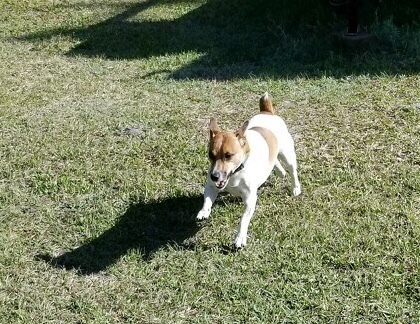 When I got the trailer home I took Tucker and his new little buddy Harley (I was babysitting Rowdy’s dog while she and the Cooler were out of town.) out to see the new toy and they were plenty excited. Later that day I began making plans for a vacation to Asheville, NC. I booked a KOA camp site, looked up a list of breweries and pubs that I haven’t been to yet and highlighted those that were pet friendly as Tucker is accompanying me, then began an itinerary that included some time at Grandfather Mountain, hiking, and just some relaxing. Then upon returning to work on the Tuesday after Labor Day we were entered into full blown Storm Prep. 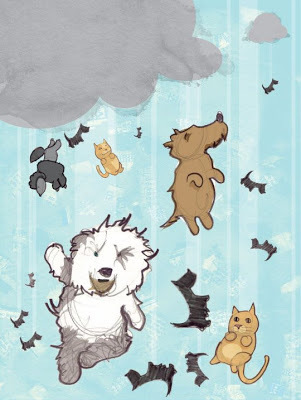 Any plans I were working on were forgotten in the milieu that accompanied the approaching doom. You may think I am exaggerating, but at the time Irma was tracking on a course that would bring her right up the middle of the state, the worst possible scenario. The devastation from that trajectory would do so much harm that the recovery could take months. At work we prepped as best we could, contacting Vendors to get as much material in ahead of time that we could, seeing what was lined up to come in and what was available after Harvey had torn up Texas. I have to give some credit here because the Vendors that we use for supplying our material needs really stepped up and made sure we were a priority for them. After that is was a matter of battening down the hatches and securing the facilities. By the end of business that Friday, except for a couple of last minute deliveries we had set-up for that Saturday and Sunday, we were about as ready as we could be for this storm. I attended a little pre-storm beer session with my fellow Beer Bacchanalians that early Friday evening and, in between answering phone calls and emails from work on my cell phone, managed to enjoy a couple of last brews before the storm hit. All of Saturday was spent on phone calls and emails coordinating schedules for after the storm restoration and determining who would be hunkered down at work during the storm. I spent so much time on this that I wasn’t able to get the outside of the house prepped for the storm until late Sunday morning. 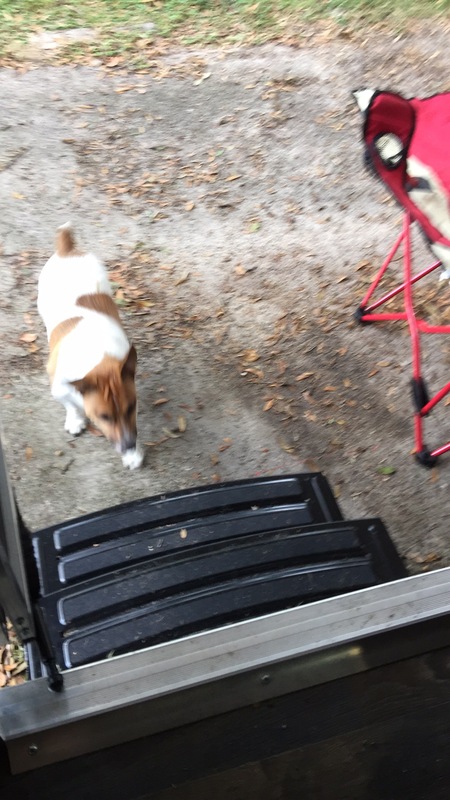 I was picking up deck chairs and making sure the new RV was secure while it was raining cats and dogs. Around 10 PM my power blinked out once for about 5 minutes. I took that as a hint that it was fixing to get bad, so when the power came back on I turned everything off and went to bed to await Irma’s imminent arrival. I actually spent the next couple of hours texting back and forth with my sisters who both also live in Florida. 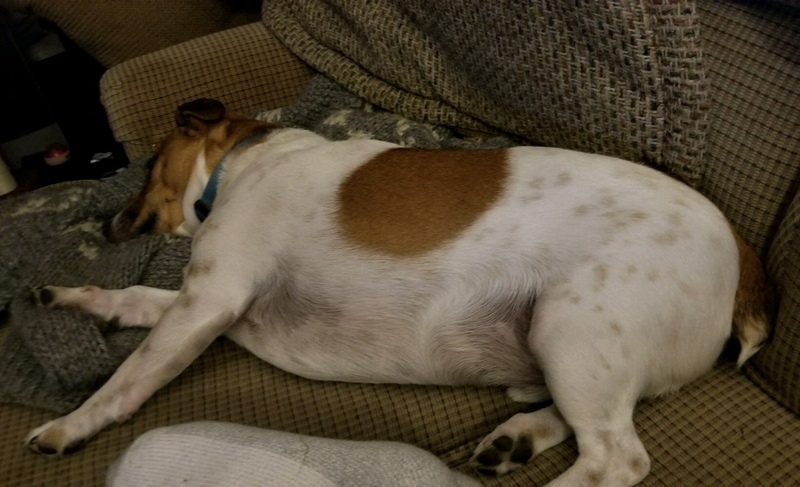 Tucker had fits all during the evening as the sounds of the storm made him restless. Around 1 AM I woke up to the sound of the wind howling like a banshee around the house and through the trees that surround my neighborhood. I began hearing the sound of the house creaking loudly coming from the corner that my bedroom was in. The sound of the wind and the creaking was enough to make me rethink my location so I got up and laid down a couple of sleeping bags in the hallway between my office and the guest room. That was centrally located and probably provided the best protection in case of a tree falling or the roof lifting off. Tucker followed me and while we tried to get some rest we both had little of it that night. At 430 AM my alarm went off and while I was already awake I knew I need to grab my flashlight and begin getting ready for the early morning storm briefing. At that point Irma had passed over us but we were still experiencing tropical force winds and would until about Noon that day. I checked out the house and saw some damage to the privacy fence but near damage to the main structure so I changed clothes and went in to work. That alone was a difficult task. Not only were trees and limbs down all over town and well as power out to most of the traffic lights, but the entrance to my neighborhood was under about three feet of water. I know that because when I drove though it, as it came up to the bottom door of my pick-up truck. Some of my neighbors were stuck there with the lower cars they had. So we all went in at Noon and worked til 10 PM that night. Then went home and came back at 5 AM in the morning and again worked until 10 PM. This routine repeated for the next 6 days. By Friday morning, all of us had been at this for at this for at least 61 hours, some longer because of the preparations for the storm. As I looked around the room all I saw were tired faces. Tired… but determined. Sunday morning while we’re dragging ourselves in to try and finish restoration to the last 1.5% of the community, while most of the folks in the area are already back to their Sunday routines of church, family gatherings and NFL football. That routine is what the last 1.5% wants to get back to… and so do we. But we’re not done yet. As the day wears on the effect of the fatigue we are feeling becomes very evident when one of my staff members is injured. Luckily, the injury is just a simple contusion, but it could have been worse and would have been easier to prevent if we weren’t all exhausted. After getting him a medical check out at the Health Center we sent him home with a lesson learned for all of us. By Sunday night we have all but 380 customers back and we plan to start working on those at first light. That is less than 0.4% of our customers. Well over 60,000 restored within a 7 day period. 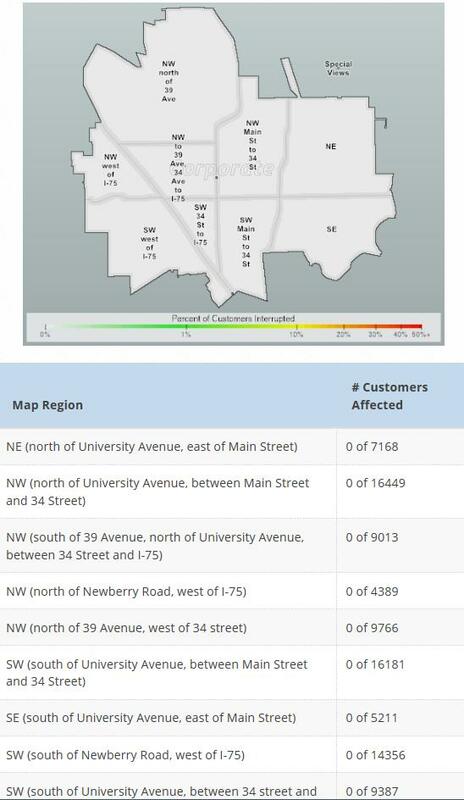 By Tuesday morning we had restored all customers back to service. Nothing enhances flavor quite like the deprivation of it. Going home for the first time in daylight that day I was finally able to do a better evaluation of my home and how it survived the storm. I talked to some of my neighbors to see how they fared. And I noticed that someone had cleaned up some of the debris in my yard and piled it for pick-up. The neighbors know I work for the utility company and knew I was at work while they could start making repairs on the damage they went through. Not only did the company I work for pull together to get everyone back up and running, but the community as a whole pulled together to help each other out. 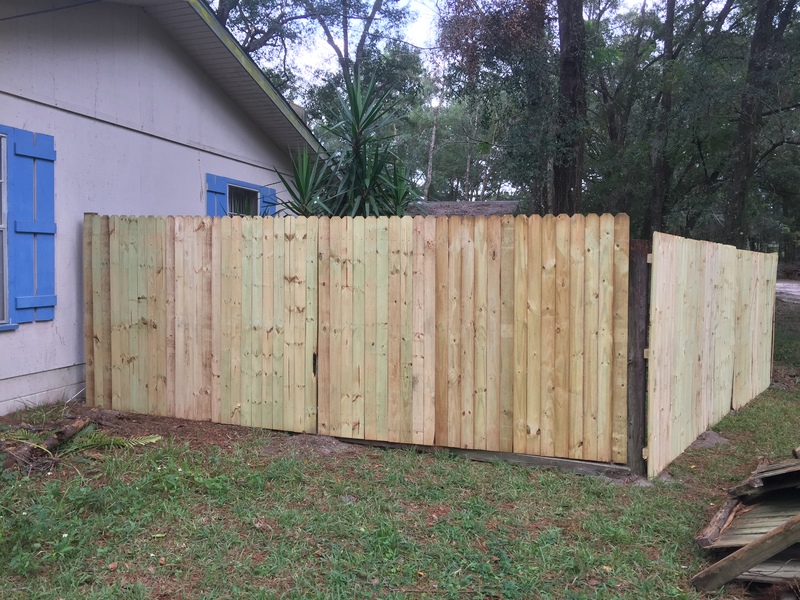 The next weekend I began working on replacing a portion of the privacy fence. 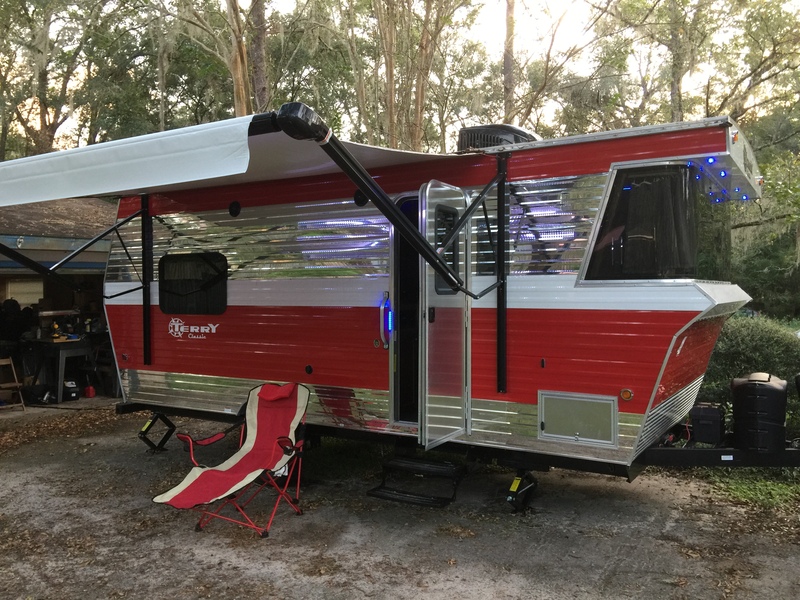 I also restarted prepping the RV for a trip I was planning in October. That was the first time I had been able to enjoy a beer since before the storm hit. I don’t know if it was deprivation or just a really good beer but nothing has tasted so good in a long time. 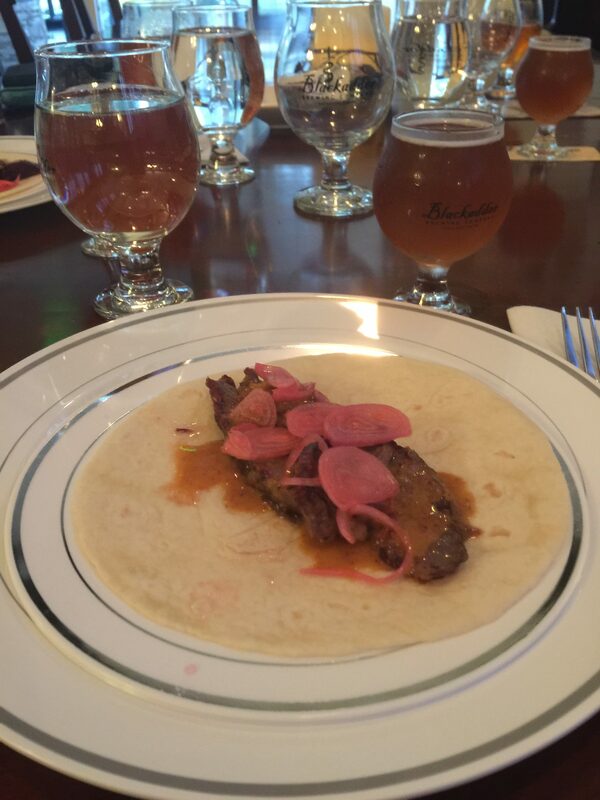 The following Monday the 25th I was joined by Rowdy and the Cooler for a Taps and Tapas dinner at Blackadder Brewing. 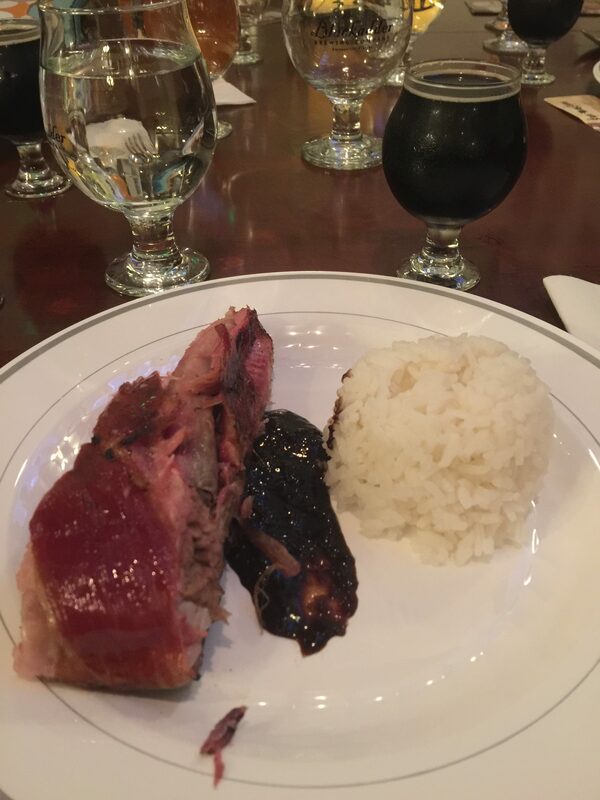 An excellent 4 course meal accompanied by 5 excellent beers. The following Saturday brought more rain back into the area but Rowdy and I decided to attend the Bacon and Brew fest in Deland Florida. They had some excellent Bacon available but the beer ran out in less than two hours. As you can see from the picture below we weren’t happy about that. We did however decide to visit one of the breweries in town, Persimmon Brewing, which had some very good beers. And Rowdy’s Mom joined us and we went to Yola Mac and Grilled Cheese for some food. Excellent food bit the service was only so-so. I finally finished the section of fence by this last Tuesday night and continued prepping for the vacation to Asheville NC, this Saturday. Tucker and I are both ready for a road trip and I have picked out some pet friendly places in Asheville to visit. Today I am attending the Gator Homecoming Parade with my fellow Beer Bacchanalians and Gainesville House of Beer. Then I will finish up my preparations from the trip and leave for Ashville in the morning. Tucker and I will report in on our visitations and provide some much needed information for this blog. It’s been too long without some wordage! My Annual Drink with Dad!! Craft Beer vs Macro!! 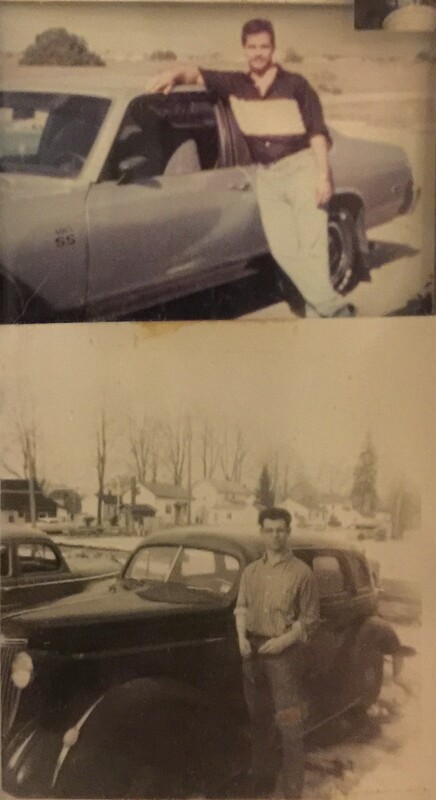 Today is my Dad’s 75th birthday. Or it would be if he were still with us. He passed away in ’98 and since then I have taken this day to drink a beer with him. I don’t know if it’s to make up for all those I didn’t get to drink with him or just my way of remembering him, but wherever I am I hunt down his beer, Pabst Blue Ribbon, and drink it in his remembrance. Today I picked Gainesville House of Beer for this annual event. 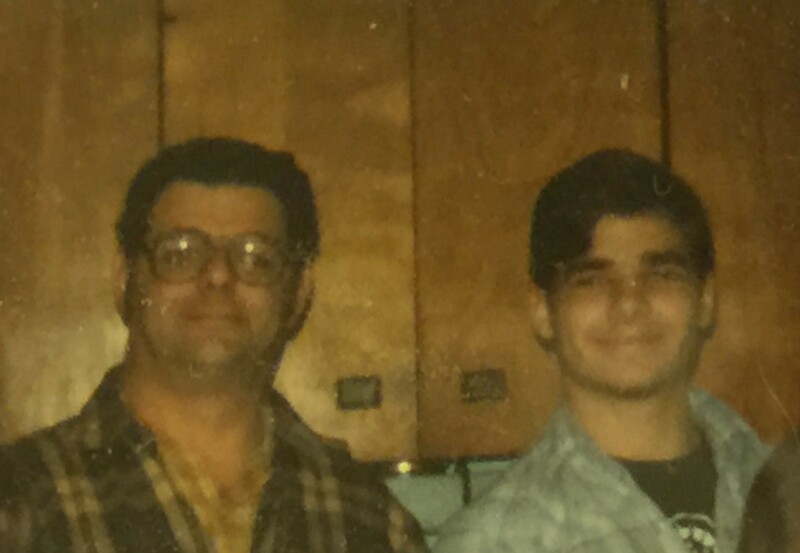 Most of us probably learned about beer from our Dad’s. Even though there are lot more female beer drinkers today than have been (at least in the US) in the last couple hundred years, I would bet even most of them learned about beer from their Dad’s. 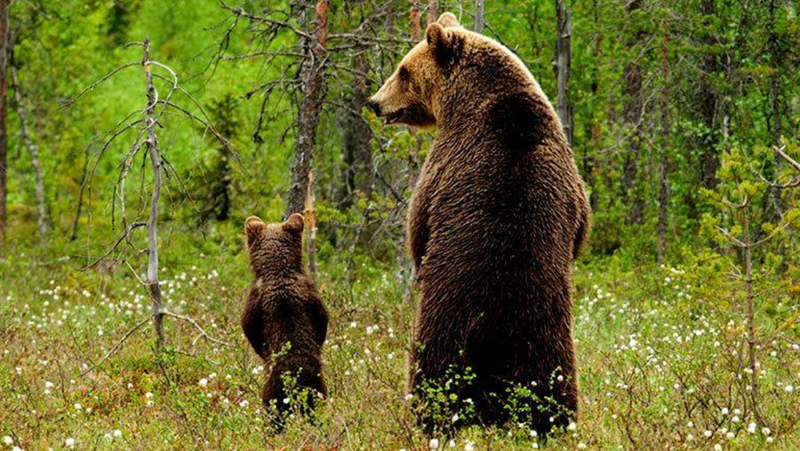 The same way we learn a lot of things from our fathers, they do, we watch, we repeat. I may not have known what he was having the first time I heard that sound but I certainly knew he was enjoying it. I catch myself doing the same thing occasionally. It’s that sound you make when you feel that quench being satisfied or the pang being quelled. I just finished his PBR and am moving on to 3 Daughters Key Lime Cider because in Florida in July light and refreshing is the way to finish on a hot day. Having said that while it did help cleanse my pallet it was not quite the “Aaaaaahhh!” I was hoping for. You see there a couple others things I learned from Dad. 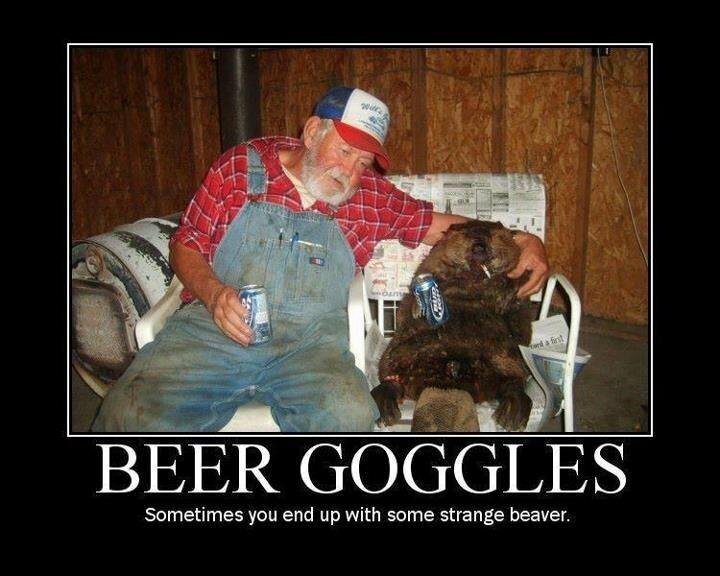 He wasn’t afraid to try something new.. at least not when it came to beer. After I got back from the Air Force or any time I went up to PA on vacation we made it a point to at least go out to a bar together at least once and have at least one beer. And it was always a draft, never a bottle or can. I learned from him that draft beers usually taste better than packaged, something that usually still holds true today. At least for me. We also tried to find a beer that we hadn’t had before. More than a few people have asked me if I thought my Dad would have liked Craft Beer or stuck with his go to. I can answer that easily. His go to beer was for sitting around the house on the weekend and doing odd chores like working on the car or helping relatives build something, or having with a family picnic. But whenever he and I went to a bar together we would always have something different. I get the tendency for that from him. Rowdy came in and joined me when the cider hit the bar in front of me. She stuck around and we philosphied a bit while supping suds. When I finished the cider I ordered an Old Rasputin Nitro, which I had had before but not as a nitro, which changes the texture of the beer certainly, but the flavor a little bit too. 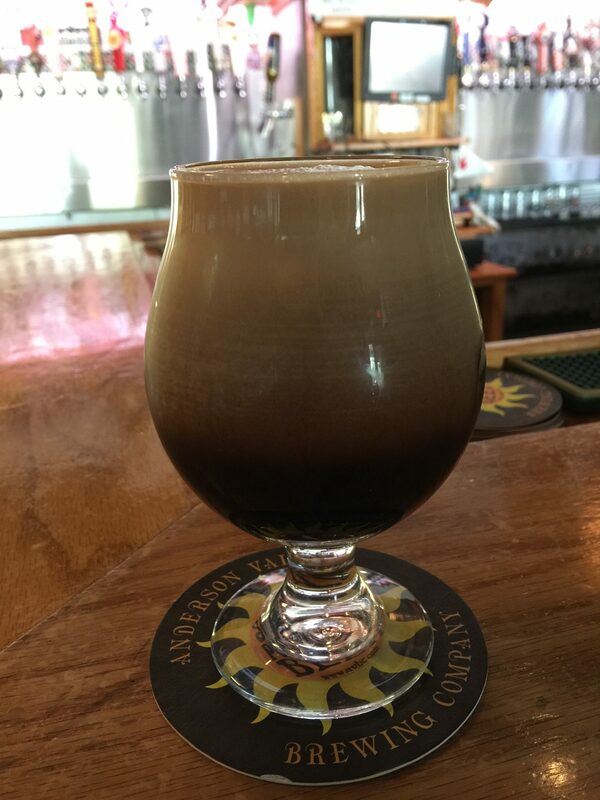 I like the coffee flavor of Old Rasputin tempered slightly with the hint of chocolate, but when you add the nitro you take what could be to some a heavy feeling beer and add a nice malty feel to it. Now that’s the “Aaaaaaahhhhh!! !’ I was looking for. So, Dad, I started this out with your go-to Macro beer, but ended up finishing it with a great Craft Beer I think you would have enjoyed trying with me. Order another round at that bar in the sky and give Mom a hug from me. Cheers!! 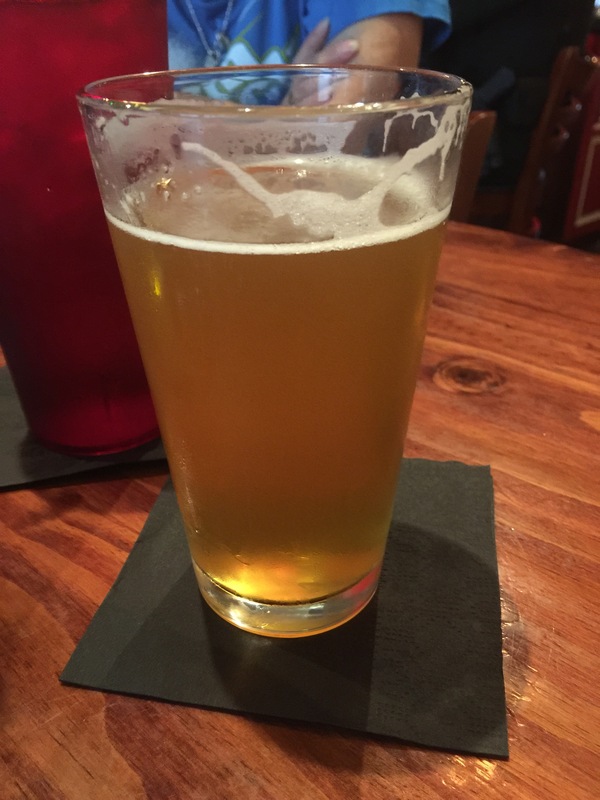 Posted on July 15, 2017 Categories Art of Beer, Beer Related Activities, Happy HourTags #craftbeer, @GainesvilleHOBLeave a comment on My Annual Drink with Dad!! Craft Beer vs Macro! !